Description: Giraffe Brooch with Clear Pave and Enamel - Goldtone figural uses caramel colored guilloche enamel, and a single black enamel eye. 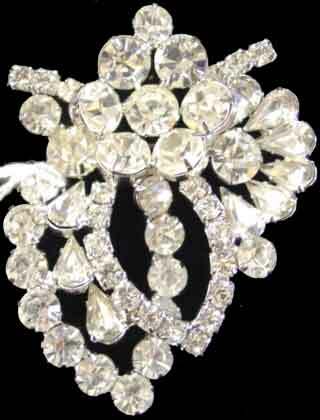 Loads of clear rhinestone pave, this measures 3" x approx. 1 1/8". Excellent condition. 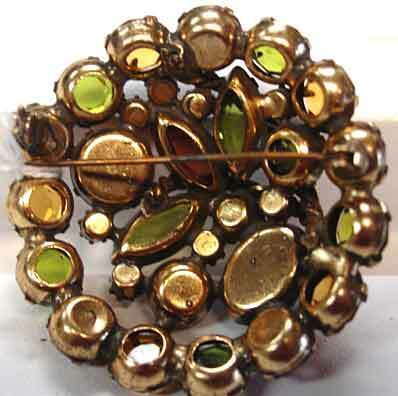 Description: Domed Fall Colors Round Brooch - Foiled and unfoiled stones in golden and smokey topaz and olivine, set in brass, with an art glass oval stone and two twisted metal ropes for even more interest. 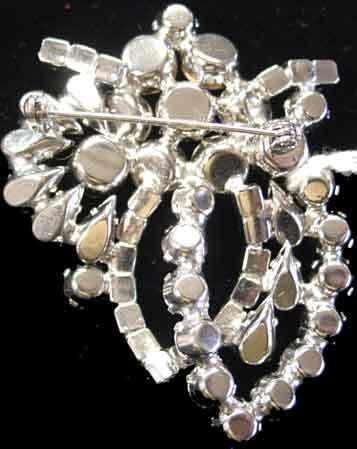 All prong set, about 2" in diameter, excellent condition with just a little aging in one or two stones. A great way to tie that fall ensemble together. 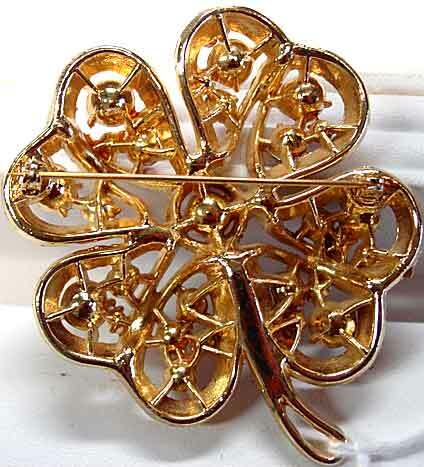 Description: Goldtone Four-leaf Clover Brooch with Topaz Aurora Borealis Rhinestones - 2 1/4" x 2 1/2", paste set rounds in various sizes. Great condition, great price. 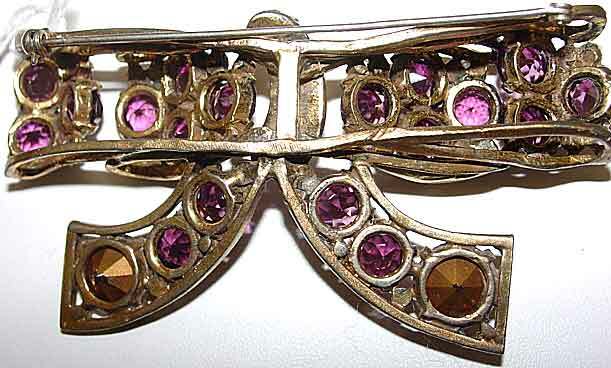 Description: Purple and Clear Rhinestone Brooch - I have seen this design attributed to Mazer but I have no proof to substantiate this attribution. However, beauty of design and construction quality indicates a major player, and this piece needs no signature for appreciation. Unfoiled purple ovals surround the perimeter of this design, with plume type accents of smaller foiled purple ovals that graduate slightly at the top. Lots of pave work and clear rhinestone accent stones. Back shows layered and riveted construction. 3" x 2", excellent condition, wonderful piece. 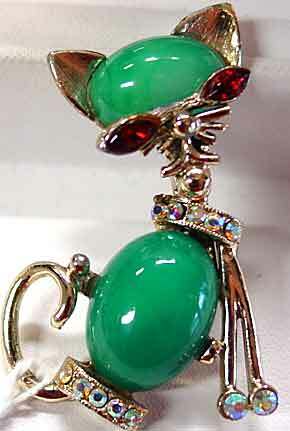 Description: Figural Cat Brooch with Faux Jadeite Cabs and Clear AB Rhinestones - This cool cat has plenty of purrs-onality! He looks like he just stepped out of a NYC Village hideaway in the 1950's, like, man, what's happnin', baby. Literally, a hep cat. Anyway, he's 2" x 1 1/8", with ruby red rhinestone navette eyes, and an AB collar and bottom. A great piece for any cat lover, excellent condition and a conversation starter. 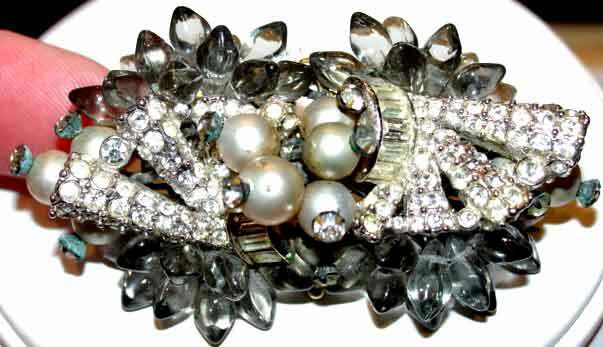 Description: Japanned Sew-On Belt Buckle with Huge Clear Stones - Fourteen 12mm stones alternate with smaller clear rhinestones on this piece, larger stones multi-prong set, on a glossy black setting. 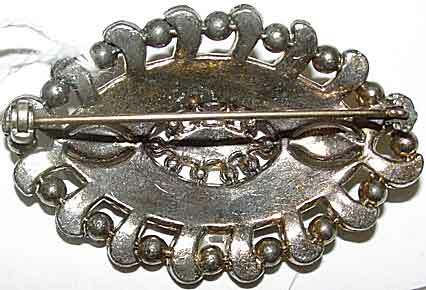 Buckle is 3 1/4" x 1 3/4". Four eyelets for sewing on. 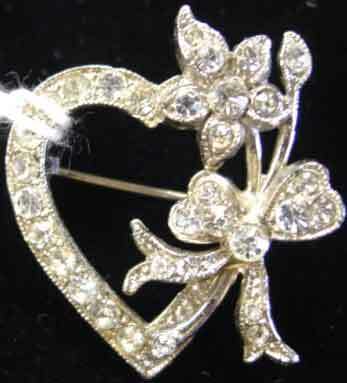 Excellent condition, great for cotillion or any formalwear. The stones alone probably justify our price on this piece. Description: Schreiner? 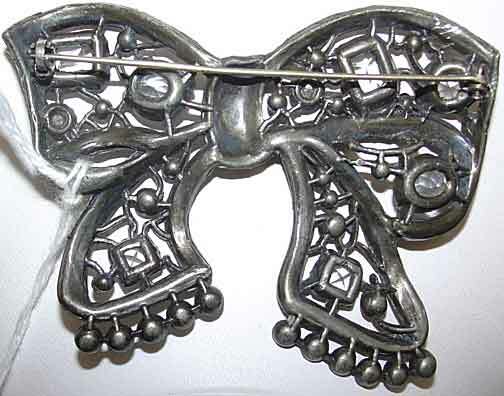 Unsigned Belt Slide - This piece looks like it was made to wrap around a belt of some kind; hook and eye construction indicates that this was not an inexpensive piece originally, and double layers and prong set stones reinforce that. As you can see from the side view, this piece is quite deep (at least 1/2 inch). 1 7/8" x 1 7/8" square, setting is antiqued over what appears to be brass, but has darkened to a color that reads close to black when viewed. Other than the fact that the center square stone shows some back spotting, which is almost unnoticeable in person but can be seen in the magnified closeups, this piece is in excellent condition. My granddaughter recently purchased a belt for a cotillion dress that had a center somewhat like this, but was not nearly as well made and was very expensive. This is a steal at this price. 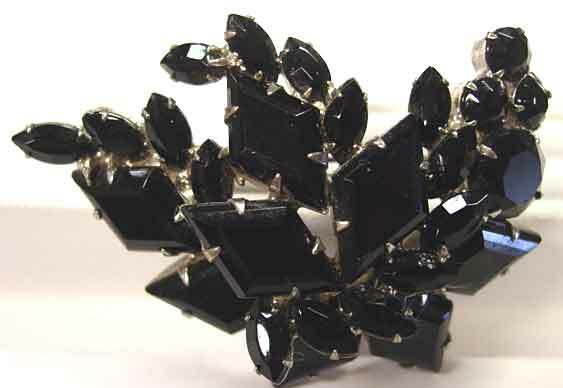 If you are into jewelry making, you could attach this to a solid cuff and have something very designer looking for a fraction of what you'd have to pay. 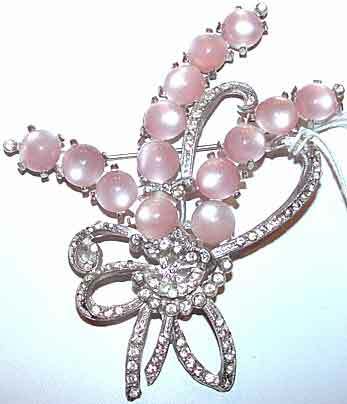 Description: Purple Faux Moonstone/Moonglow and Clear Rhinestone Plume Brooch - A favorite design, this uses purple moonglow cabs along the edges, with the rest done in clear rhinestone. Silvertone, potmetal setting, almost 4" x 2" at widest points. Usual darkening of the clears as would be expected of an 80 year old piece, a few of the rhinestones look to be replacements, though they are the correct size and nicely done. If you want "looks brand new" then this probably isn't the piece for you (unless you want to restone it), but if the charm of vintage is that it doesn't look new, then this is in fine shape. 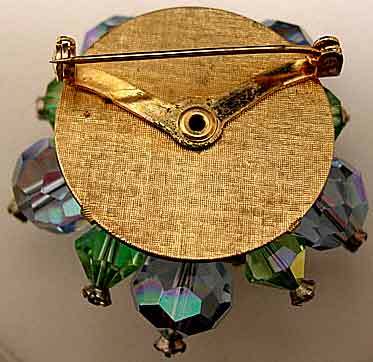 Description: Japanned Pinwheel Brooch with Aqua/Capri/Olivine Rhinestones - This looks like it should be signed Weiss, but it is not. 2 3/4" at widest points (diameter), curved for dimensionality. Light aqua and Capri (peacock blue) rounds, olive green marquise and single round at center. Excellent condition, all stones paste set. 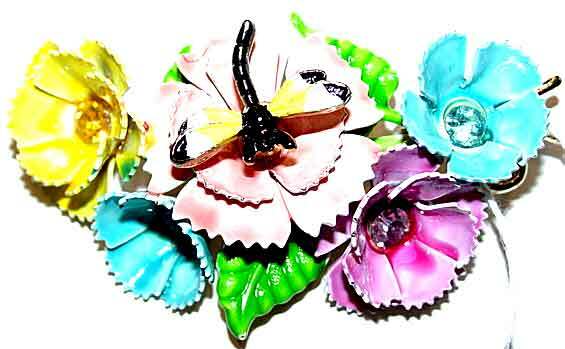 Description: Charming Flower Basket Brooch with Molded Plastic Flowers - This piece has it all, multi colored and clear rhinestones, green enameled leaves, glass cabochon accents, and molded plastic flowers all set in brass. 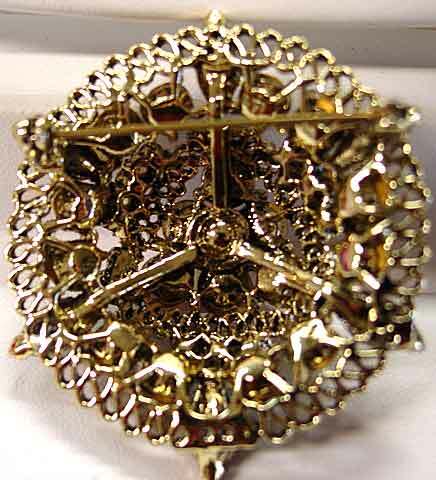 2 1/4" x 2"; brass setting has darkened with time. Enameling is in good shape. All would appear to be original except the yellow cab on the far right, which looks to be a faux moonstone rather than opaque glass. I don't find this to be noticeable, however, I have priced it accordingly. 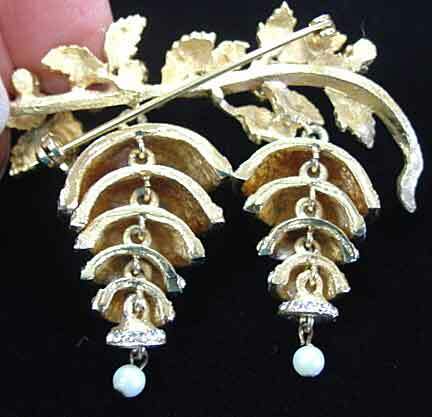 Description: Double Dangle Articulated Goldtone Glass Pearl and Rhinestone Stylized Fruit? 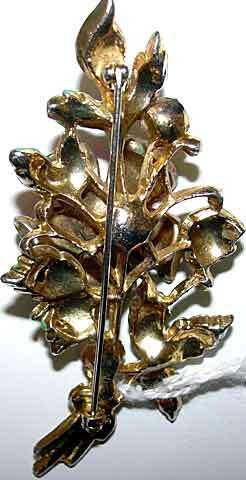 Pin - I am not sure what this is depicting - stylized grapes?? 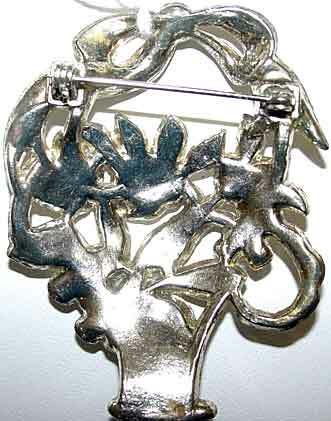 but who doesn't love a brooch with two articulated dangling sections, especially when there is so much detail work! 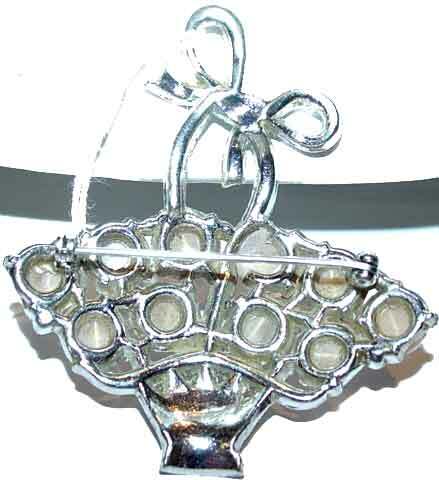 All of the "bells" in the dangling section have a front bottom edge of clear rhinestones, with the bottom edge going all the way around. 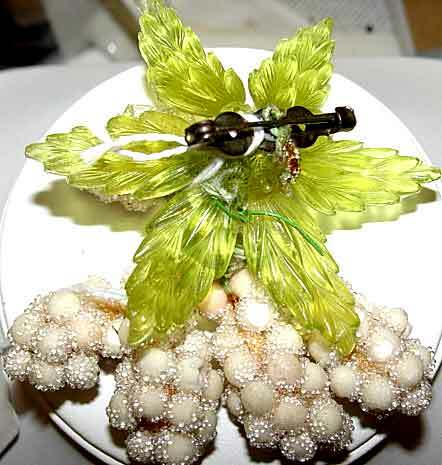 The leafing branch is accented with four small creamy white glass pearls, with an additional glass pearl terminating the dangles. Goldtone, 2 5/8" x 2" at longest points, excellent condition with a difficult-to-see dark line on the top of the right bell that doesn't affect the appearance in any way, but is noted for accuracy. 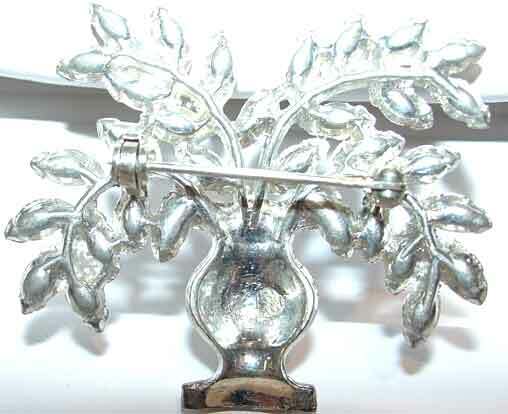 Description: Aqua and Clear "Window" Brooch - The unusual design looks almost like a window frame with a curling plume or foliate vine intertwined. You almost never see pieces with parts that go in and out like this! 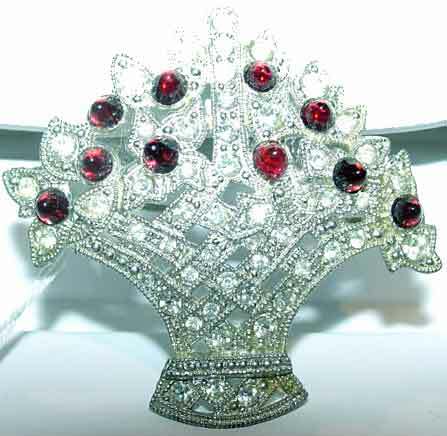 "Frame is done with clear octagonal rhinestones, with the vine made up of aqua marquises and clear baguettes. All stones prong set. Excellent condition with two solder spots from what is apparently a long-ago repair. 2 1/4" x 1 3/4". 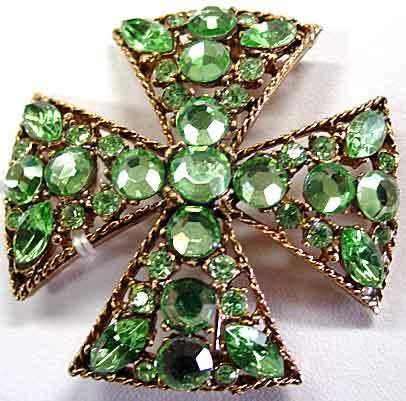 Description: Maltese Cross Brooch with Peridot Colored Rhinestones - Set in goldtone, this uses flatback rhinestones in a row at the center of each part, with small pointback rounds and marquises flanking each row. 2" in diameter, excellent condition. 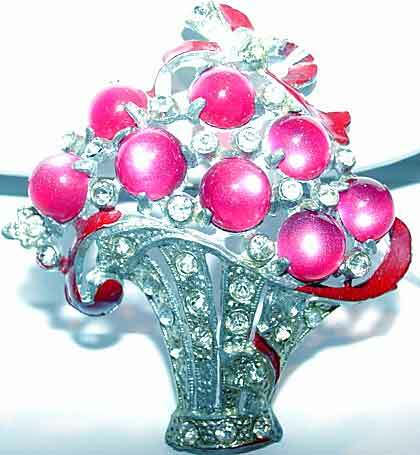 Description: Ruby and Clear Rhinestone Pin Pendant - A pretty and versatile piece, just right for Christmas or any time you wear red. 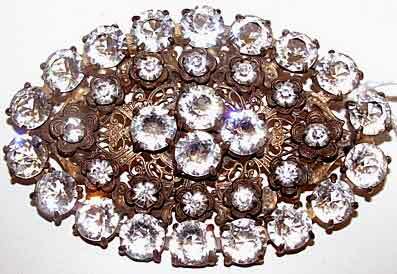 Center is a pave half ball, surrounded by a row of clear ovals, with tiny rounds in between. Outer row of larger, unfoiled ruby ovals alternates with small clears on the inside and larger clears on the outside. 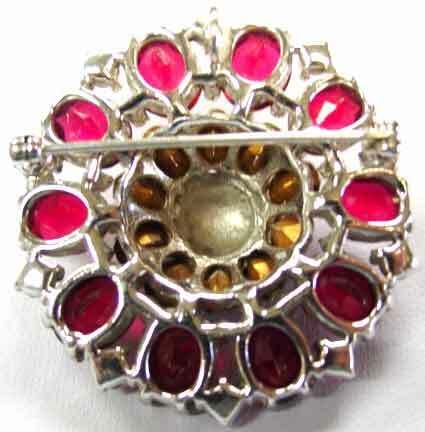 The ruby glass stones are all prong set, as are the clears along the edge. About 1 3/4" in diameter, with domed center being about 1/2" deep. 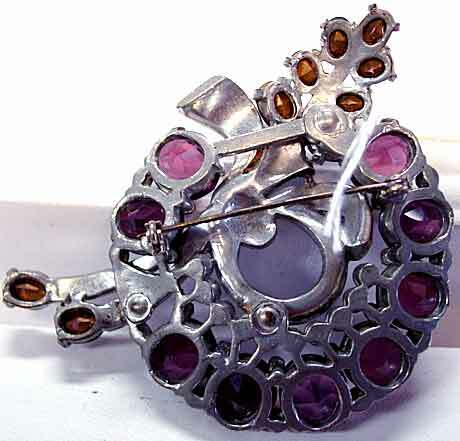 Pendant ring is visible at the top of the backside photo. Silvertone, excellent condition with just a little greying of the clears around the edge of the piece. 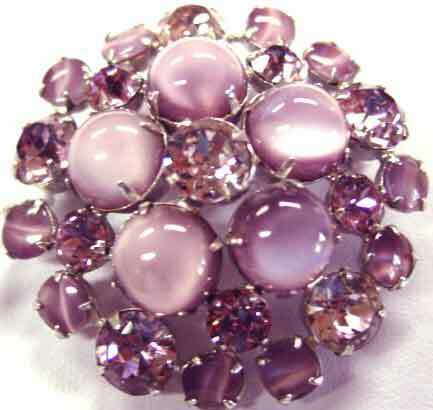 Description: Purple Faux Moonstone and Lavender Rhinestone Brooch - Pretty and quite unusual; purple faux moonstones are uncommon, and the lavender rhinestones are all dentelle (fancy)cuts. 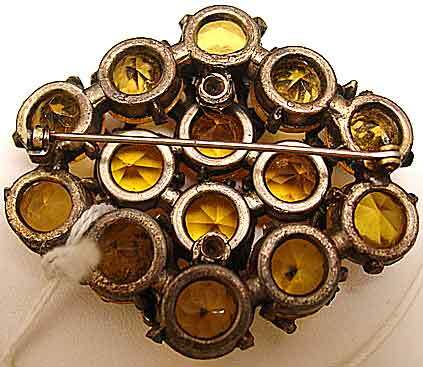 Very slightly domed, 1 3/4" in diameter, all stones prong set. Silvertone, excellent condition. 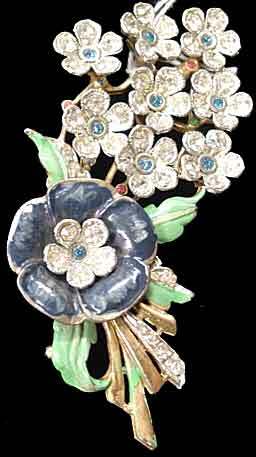 Description: Blue Enamel and Rhinestone 3-D Floral Brooch - This uses an unusual, almost metallic looking dark navy enamel. 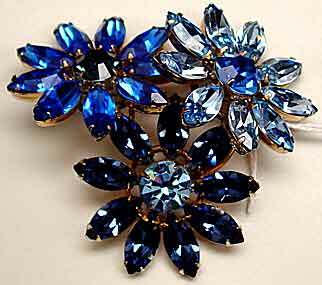 Floral heads have a front and back, from which protrude medium blue rhinestone set pistils; flower heads are edged with clear rhinestones. 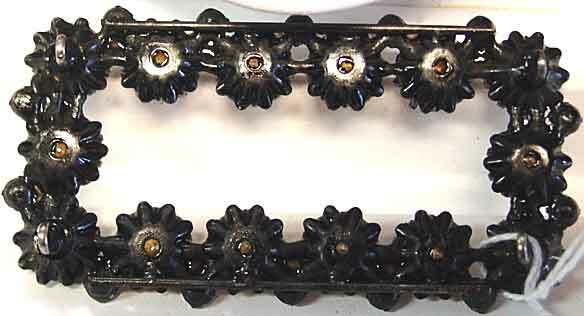 Goldtone setting, 3 1/4" x 1 5/8", with florals about 3/8" deep. Excellent condition. 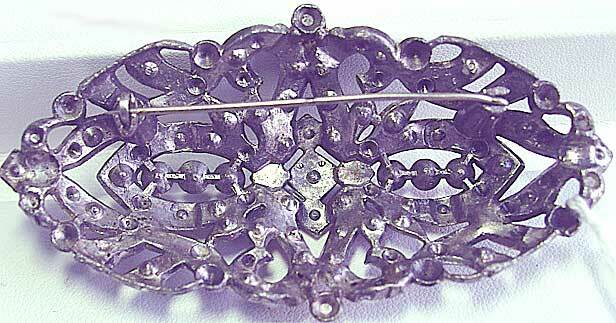 Description: Purple and Clear Floral Brooch - Probably from the 1930's, this piece uses a large purple round, surrounded by a row of small clears, and then purple marquise petals for the flower head.The stem and leaves are all done in various sizes of clear rhinestones, all set in potmetal. 2 3/4" x 2 1/4". There were quite a few missing small clears when I got this, all of which I have replaced. Quite a little charmer, and an excellent price. 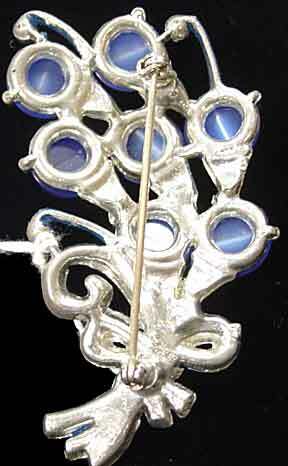 Description: Rose Goldtone and Silvertone Brooch with Cobalt Oval Stones - Mesmerizing stones in that deep blue, almost purple color that can only be found in cobalt glass. 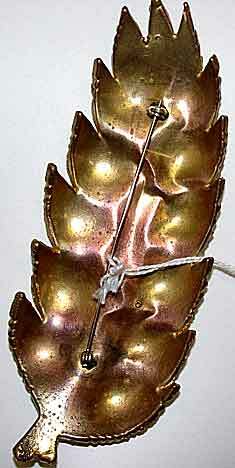 Silvertone leaves are set with small clears, "frond" is in rose goldtone. Done in two layers. Excellent condition with only a little plate wear on the stem. 4" x 1 1/2'. 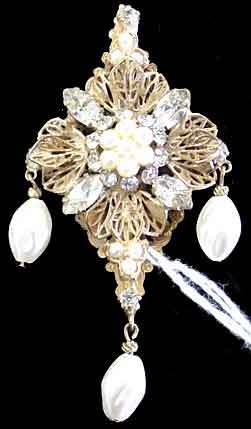 Description: Haskell Look Triple Dangle Glass Pearl/Rhinestone Brooch - Central fleurette of glass seed pearls is bordered by prong set rhinestones with an outer row of clear marquises that alternate with goldtone filigree. 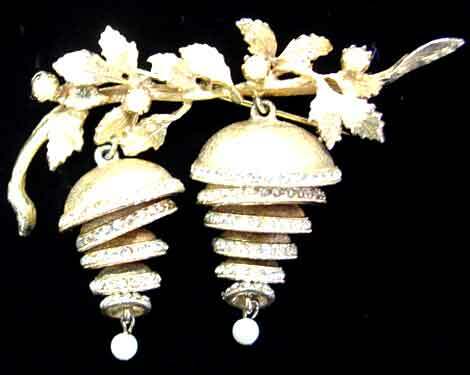 Three small seed pearls at top and bottom, with dimpled oval glass pearls dangling at each side and bottom. Top is set with a single rhinestone. Excellent condition, 3" x 1 1/2". 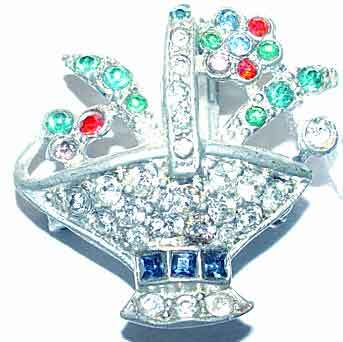 Description: Crystal Aurora Borealis Bead Brooch with Rhinestone Headpins - Component rich brooch has excellent quality aurora borealis beads, each attached with its own aurora borealis rhinestone headpin. All hand wired into the base; 2" in diameter, silvertone. Excellent condition. I have had similar pieces in the past signed Hobe. 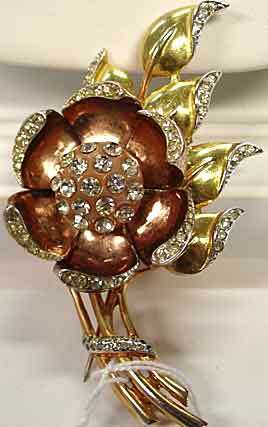 Description: Floral Brooch with Rhinestones and Enameling - This huge 4" x 3" floral is unsigned but looks and feels top quality. 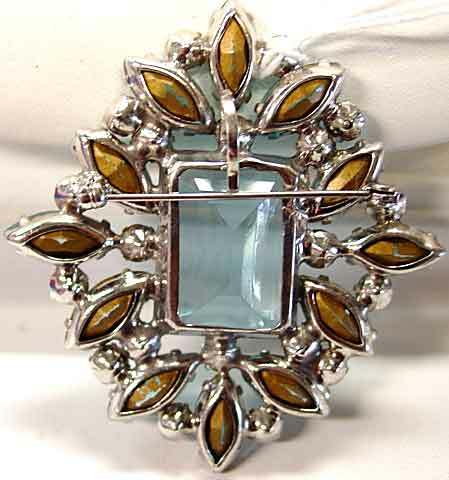 Topaz oval rhinestones and lots of clear rhinestones are accented with brown and green enameling, done in the style that Trifari did their enameling. "A rose by any other name would smell as sweet"! So whoever did this did a wonderful job. 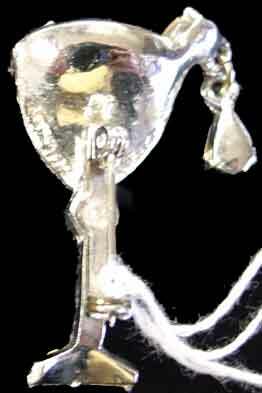 This impressive piece is in excellent condition except for a chip out of the enamel on the bottom of the middle stem (this could conceivably be repaired by an enamelist adept at matching.) This design was done in other colored rhinestones as well (blue, green, etc). These were never easy to find but are now almost impossible to locate. 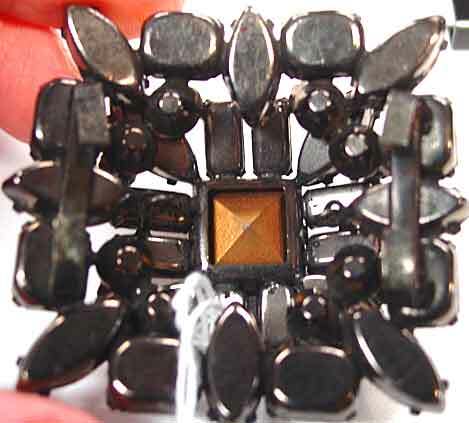 Description: Black Rhinestone Brooch with Diamond Shaped Stones - This is possibly a D&E manufactured piece, but I have nothing concrete to base it on, regardless, it is an interesting design and would look great against any lighter colored piece, great for tying an outfit together with black pants or skirt. 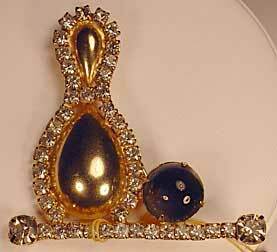 The larger black "diamond" shapes are accented with black marquises and a few rounds. 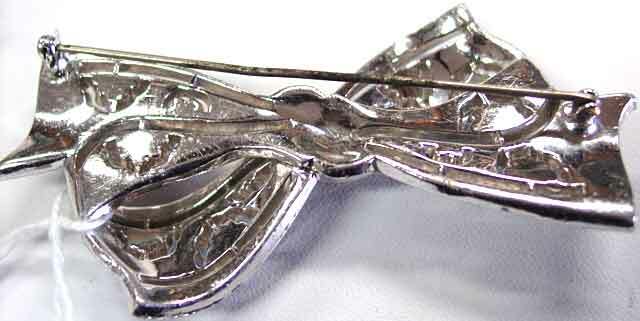 2 1/2" x 1 7/8", layered design, set in silvertone. All stones prong set. 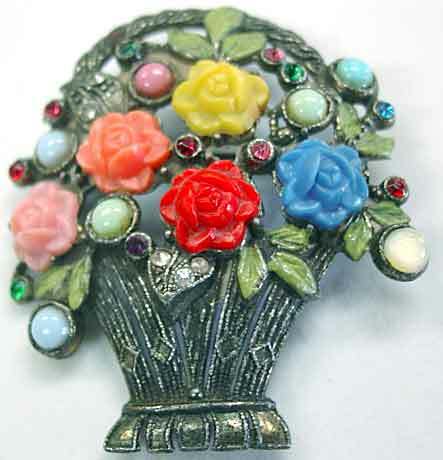 Description: Floral Bouquet Brooch with Enamel/Rhinestones - When I first saw this piece I was thinking it was unsigned Trifari - the two-tone enameling style, the clear/blue florals, the general design.However, I am relegating this to the "unsure" pile, because the frame behind the blue/clear florals is set with small pastel rhinestones (if you look closely you can see some of them) - nothing wrong with that, but it just doesn't seem like Trifari. Regardless of who made it, it is very pretty and in excellent condition, with just some of the green enamel gone off the bottom stem. A mix of goldtone and silvertone, 3 1/4" x 1 1/2", with enough weight to it that it is doubtful that it is a vintage reproduction. 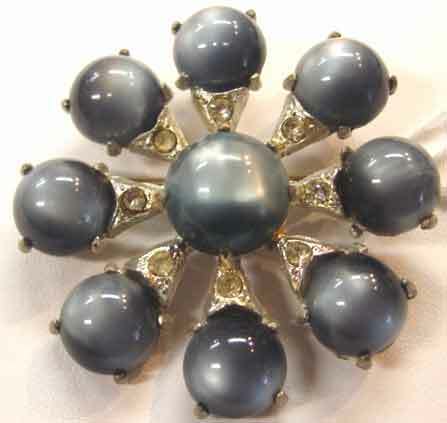 Description: Dark Blue Faux Moonstone/Enamel/Rhinestone Brooch - This is almost certainly unsigned Coro but no marking. The blue moonstones are darker than what I see on my monitor, as is the enamel. 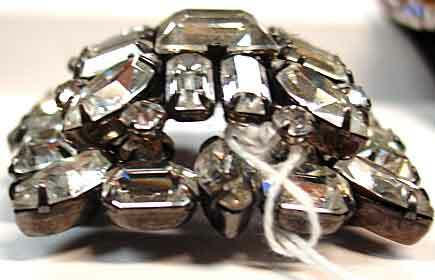 The rhinestones are in nice shape, all is in excellent condition. Silvertone, 2 7/8" x 1 1/2". 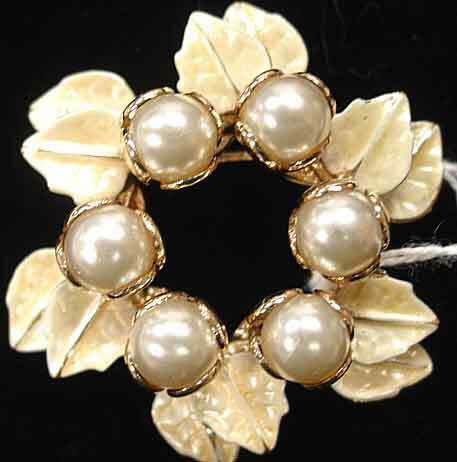 Description: Glass Pearl and Enamel Wreath Brooch - While I don't believe this was made to be a Christmas brooch, you could probably use it that way; however, it is fine for any time of year and will work when a more specific color doesn't. Extremely nice glass pearls are in a kind of "looped" setting that I don't think I have seen before (you can see it in the backside picture), about 9mm in diameter. Leaves are enameled in a translucent dark cream color and set in a double layer. 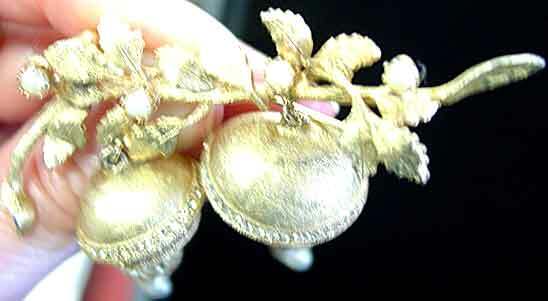 Goldtone setting, 2" in diameter, excellent condition. Very nice piece. 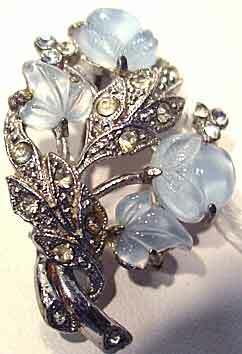 Description: Light Blue Faux Moonstone/Rhinestone Retro Brooch - There's just something about the leaves on this brooch that really appeal to me, they are reminiscent of something but I can't quite remember what. 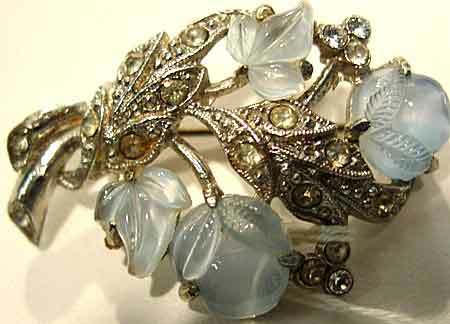 At any rate, four light blue oval faux moonstones are the "florals" in this stylized piece, with prong set clear rhinestones on the stems and topped with goldtone leaves. Nice weight, not quite 3 1/4" x 1 1/2". Some of the clears have greyed, and there is a little spot of something on the back (solder??) but it doesn't attach to anything, so I don't know what it is. 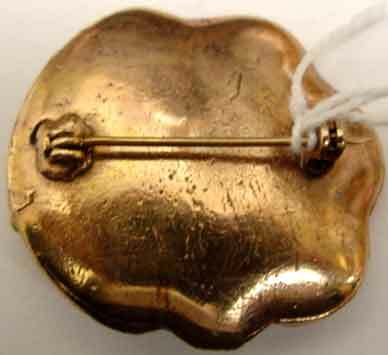 It does not affect the brooch in any way, but mentioned for accuracy. 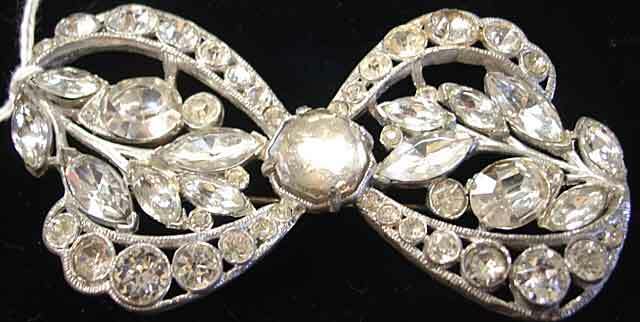 If you like 1940's style, here is a nice piece for a very reasonable price. 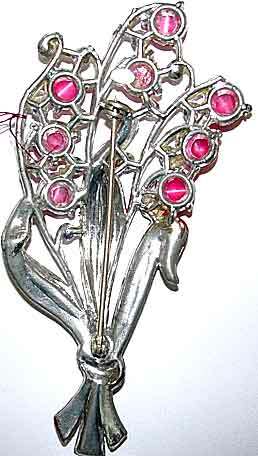 Description: Pink and Clear Rhinestone Feather Brooch - Stylized feather is done with prong set rose pink marquises surrounded by prong and paste set clear rhinestones. 3 3/4" x 1 1/2" at widest point, silvertone setting, excellent condition. Beautiful!! 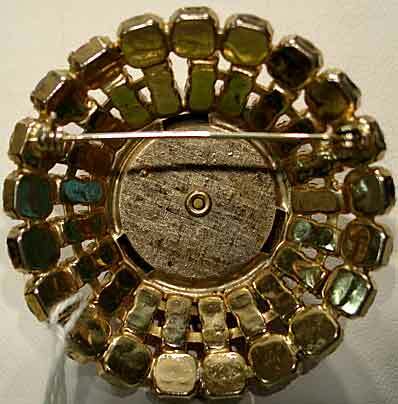 Description: Art Glass Marbelized Stone and Chain Waterfall Brooch - Unusual oval stone is a muted yellow with brown swirls, and a purple irridescence that is really eye-catching. 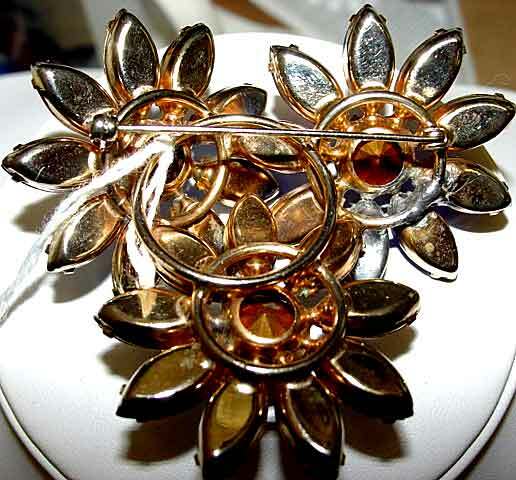 Eight rows of goldtone chain dangle down from the center, with golden and Madiera topaz navettes and rounds all prong set filling out the design. 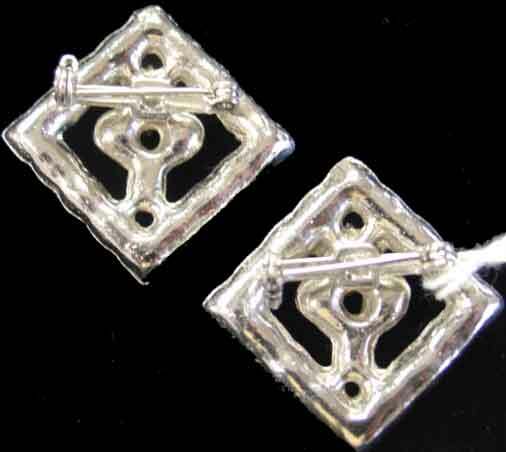 Domed, 3" to bottom of dangles, x 2". 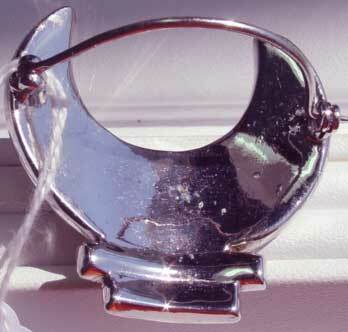 Excellent condition except for a small chip out of the bottom of the art glass stone, which is not replaceable. Price reflects. 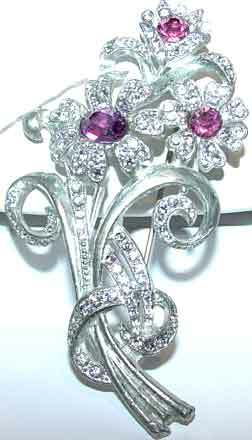 Description: Magnificient Pink Sterling Floral - Beautiful pink oval glass stones top a beribboned bouquet, with rhinestone set leaves and floral caps. 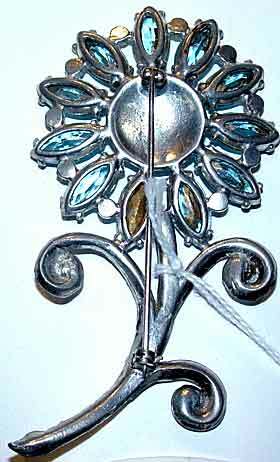 At almost 4" x 2 3/8", this piece has enough openess in the design to keep it from being gawdy or overwhelming. Very good condition with commensurate aging to the small clears . 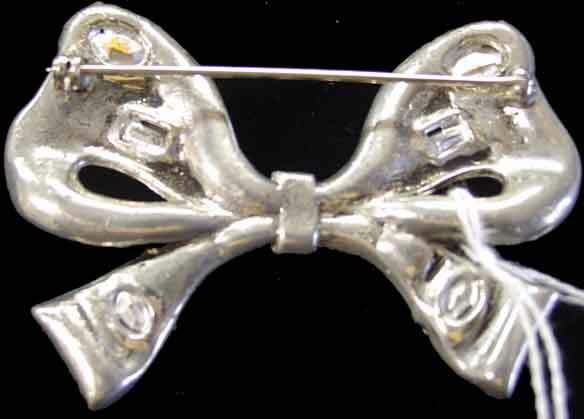 Description: Shriner/Masonic Rhinestone Brooch with Curved Pinstem - I am not sure what the significance of the curved pinstem is, but I am assuming this was to be worn over something thick so that the pinback could go behind. 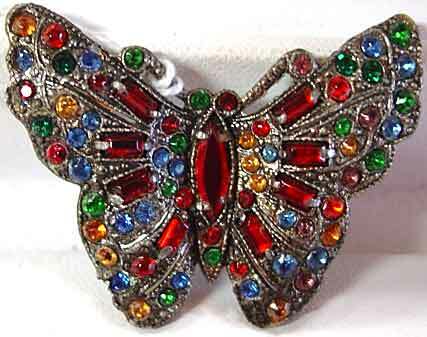 Stone colors are ruby red, emerald green, and clear rhinestones, silvertone setting. Very small rub spot on the plating as seen on the picture. Excellent condition. 1 3/4" x 1 3/4". Description: Retro? 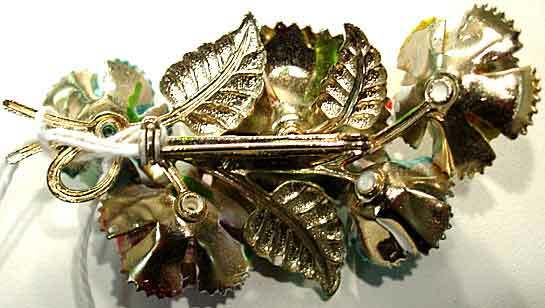 Gilt Jeweltone Brooch with Wired Stems - These pieces are almost customizable as you can bend them, with care, into a slightly different arrangement if you so choose (like flower arranging!) Each wire, of varying lengths, ends with a jeweltone unfoiled oval glass stone, in a setting which not only protects the stone but holds it in place as well. Goldtone setting. While I have shown it with the florals going up, because of the pin placement it may have been meant to sit in the direction that I have it shown at for the back view, with the florals cascading downward. 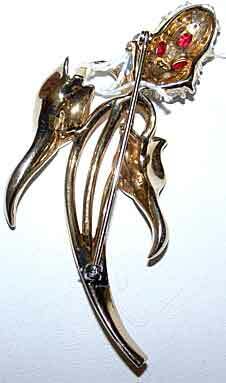 At 3 1/2" x 2 1/2", this is a substantial brooch. Mild plating wear towards the bottom, otherwise excellent. 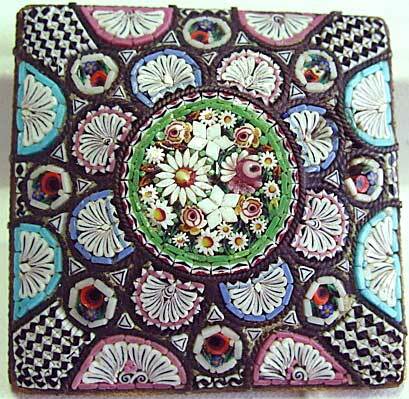 Description: Large Square Mosaic Brooch - I hesitate to call this micro-mosaic as I am not super knowledgeable about this genre, but it is the nicest and uses the smallest tessarae that I have ever had (see the corners of this piece!). Back is marked WRC; I was fully expecting it to say Italy, and I have no idea what these initials stand for. C clasp, pinstem is hand done and I am not sure if it is original or a replacement. Backside has usual wear, topside is almost damage free except for a tiny area at about 2 o'clock in the picture, a few tessarae are pushed in and one around one of the circles is missing. 1 5/8" in either direction. Even considering the flaws, this is an exceptional piece. 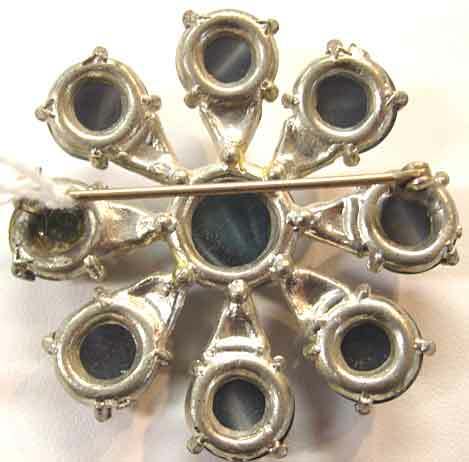 Description: Large Domed Czech Look Brooch - Done in all multi jeweltone stones and a darkened silvertone setting, this is unusual in size (3 1/4" x almost 2") and about 1/2" deep as it is domed. Nicely detailed and in excellent condition, this is bargain priced. 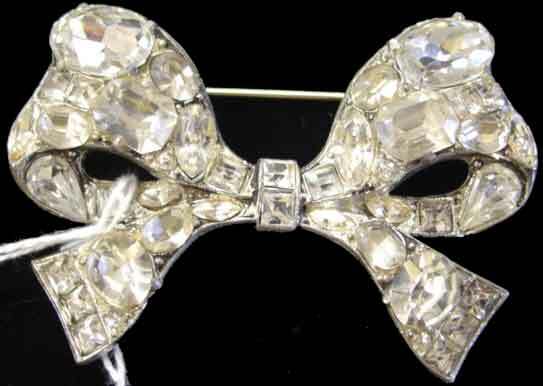 Description: Extra Large Clear Rhinestone Bow Pin - At 3 5/8" x 2", this commanding piece has everything going for it except a signature. 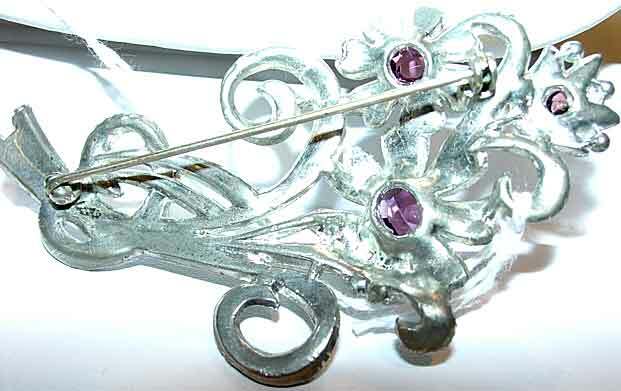 Dentelles and chatons in various sizes border the two loops of the bow, with the center made up of marquises, ovals and rounds around a 14mm rauten rose cut clear stone. Setting is potmetal. Very good condition, with some darkening to the mirrored back of the rauten rose, and slight yellowing of some of the rounds. This looks somewhat like an unsigned Eisenberg, but without a signature we'll never know. 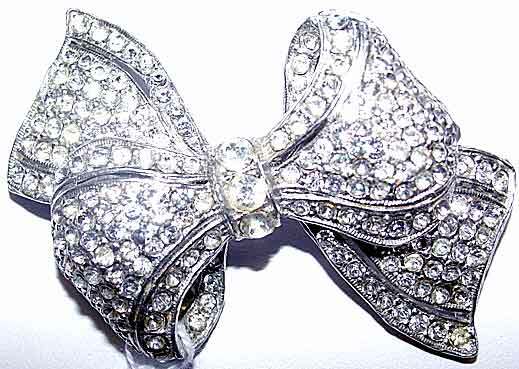 Description: Beautiful Clear Rhinestone Bow Pin - 2 5/8" x 1 7/8". 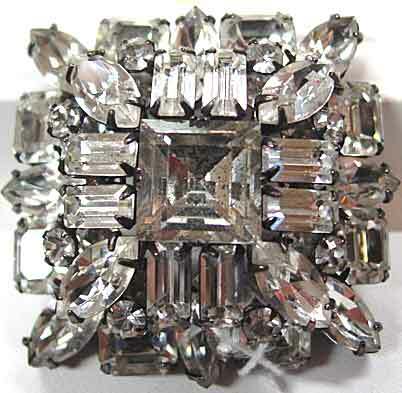 This uses a mixture of square, oval, marquise and octagonal cuts, with only 4 small clear rounds. Potmetal setting. A little yellowing to some of the glue originally used on the piece but the stones themselves seem to be in excellent condition. A very nice size for almost anyone's taste. 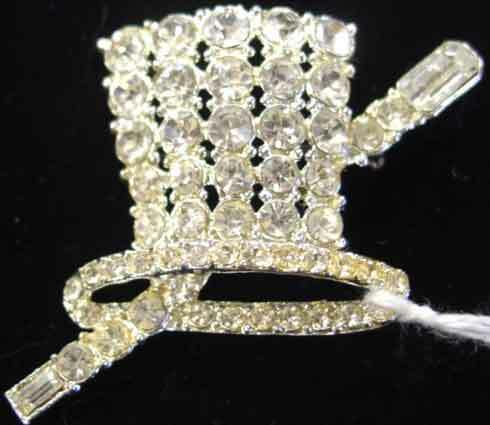 Description: Top Hat and Cane Brooch - Thanks to the movie musicals of the 1930's, the top hat became a popular motif to show your savoir faire. Done entirely in clear rhinestone rounds and baguettes, all stones appear to be original and the only drawback is that the original glue has yellowed and is particularly noticeable on the righthand side of the hat brim. 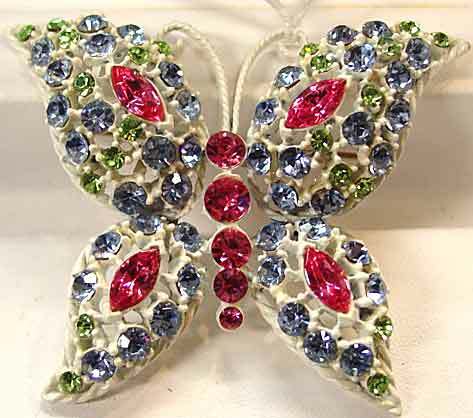 Believe it or not, there are actually people taking wood stain to brand new rhinestone pieces to get this same effect! Well, here you have the genuine article. 1 3/8" x 2". 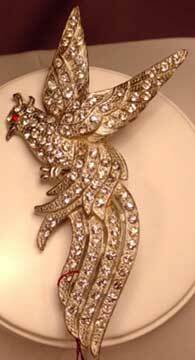 Whether you are a dancer, a lover of Fred Astaire, or simply want a great conversation piece, this is a fun piece. 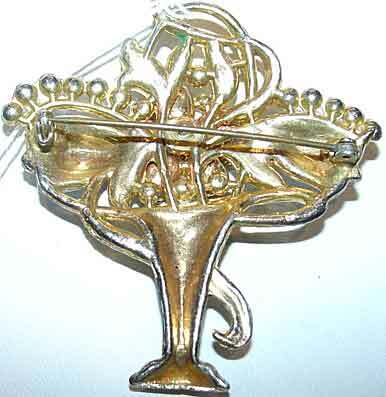 Description: Champagne Glass Pin - or perhaps this is a martini, whatever, this is a cute pin and would make a nice companion piece to the top hat/cane, UP8-859. 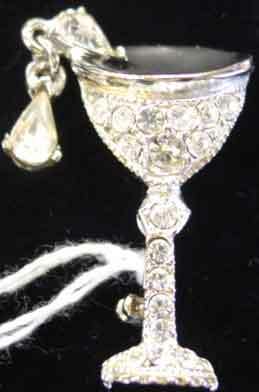 Done in clear rhinestones and black enamel, some clever person has two teardrop stones (one dangling) coming out of the top of the champagne glass. About 1 1/2" x 1". Not an expensive piece, but as with many inexpensive figural pieces of that time frame, are very collectible because of the sense of humor behind them. 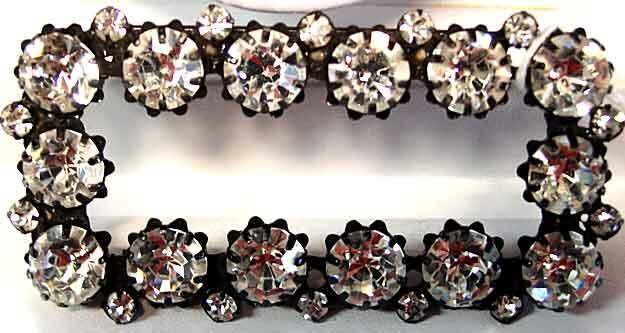 Description: Set of Clear Rhinestone Twin Pins - For a 1950's look, attach these to a sweater or a favorite hat. Square shapes are made to be worn at an angle. 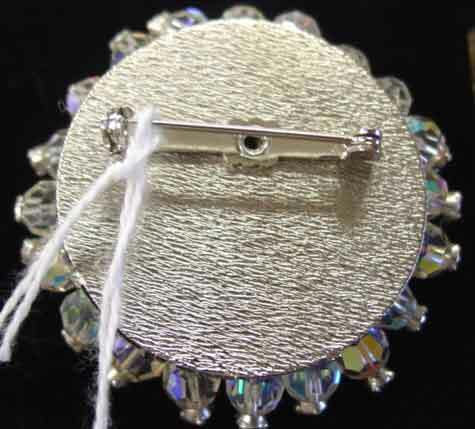 Each pin is 1" x 1" and completely rhinestone set. 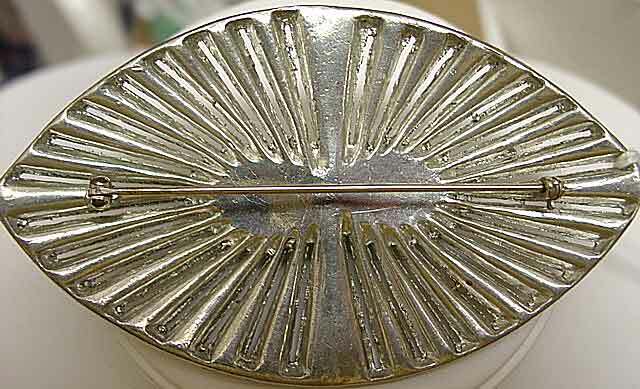 Silvertone setting, applied pin back. 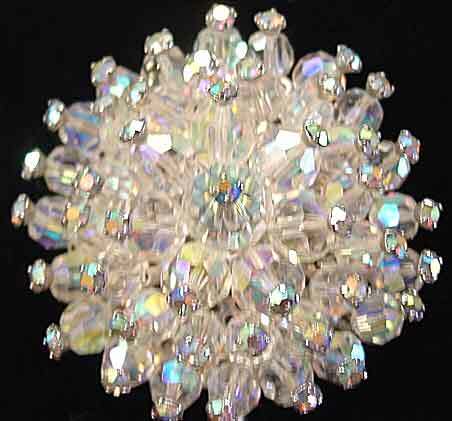 Description: Large Dimensional Clear Rhinestone Floral Pin - 3 3/4" x 2 1/2". 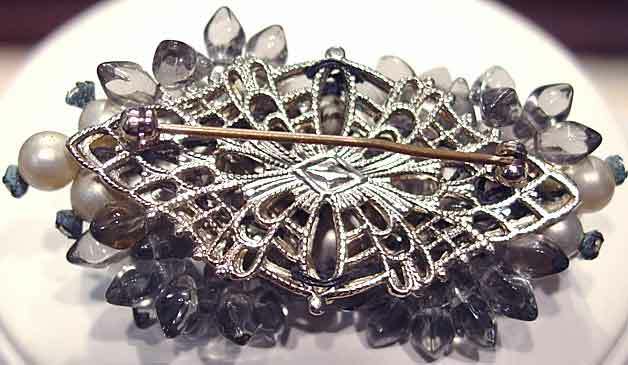 This uses almost all round clear rhinestones, except for the "stamens" being baguettes. 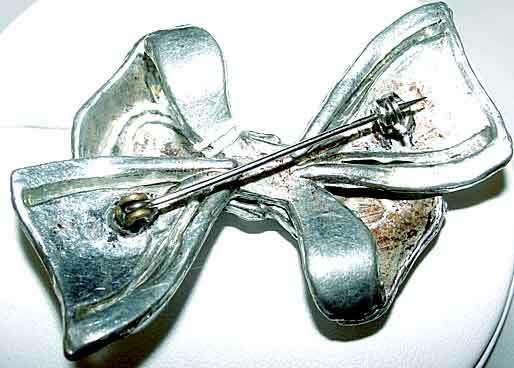 Please notice in the closeup the fact that this flower is three dimensional, with silvertone metal petals surrounding the center of the flower. 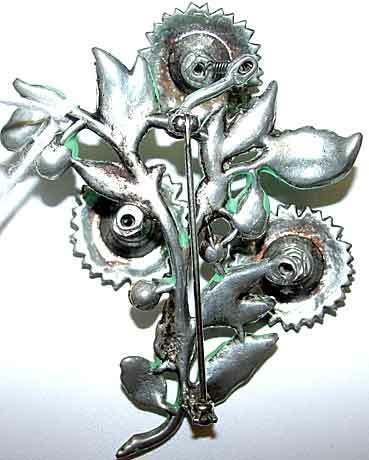 The rest of the piece is almost entirely pave set except for some of the stems or parts of the stems being plain metal. Some mild yellowing of some of the glue/stones, otherwise excellent condition. 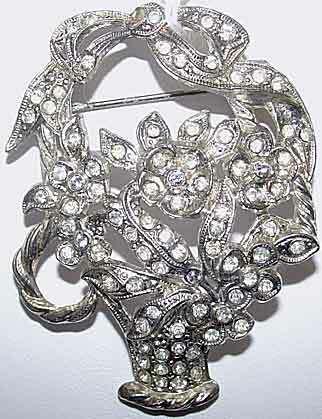 Description: Larger Clear rhinestone Brooch - 2 1/2" x 2", this is made like Weiss but no signature. 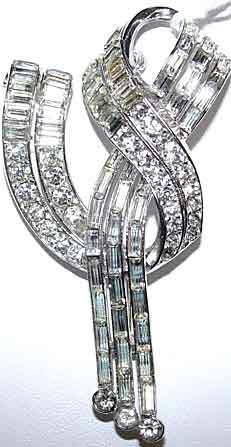 The design is made up of rounds and teardrops, with the loops at the bottom entertwined for dimensionality. Silvertone, all stones are prong set, excellent condition. 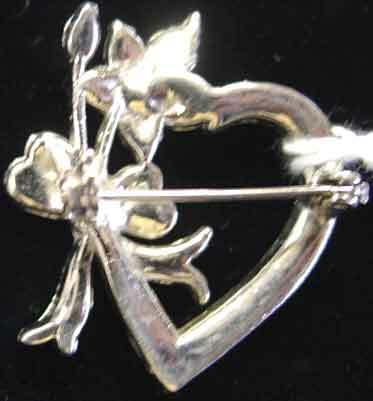 Description: Sweet Heart with Flower and Bow Pin - Diminutive heart with a small heart and a small bow as an accent - what could be more charming. 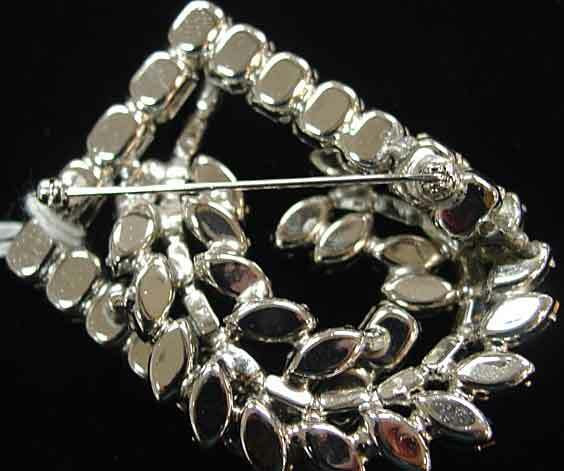 About 1 1/4" x 1", all rhinestone set, silvertone setting, excellent condition. Perfect for the bride for something old! 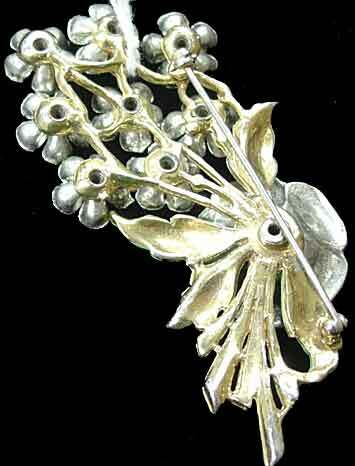 Description: Jointed Clear Rhinestone Floral Dangle Brooch - Delicate looking dangle brooch has the look of fine jewelry, with the bottom half of the piece being free-swinging. Marquises, rounds and pave set clears make up this 3" x 1" piece. Ingenious design gives the feeling of flowers spilling over a garden wall. Excellent vintage condition with very slight yellowing to one of the marquises. 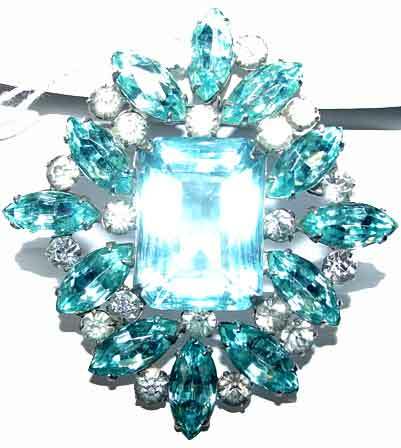 Description: Aqua and Clear Rhinestone Pin Pendant with Beautiful Step-Cut Center Stone - Large unfoiled octagonal stone with step-cut faceting is surrounded by prong set aqua marquises and clear rounds. Silvertone setting, 2 1/2" x 2 1/4". Bail on back is large enough to accomodate a fairly good sized chain. 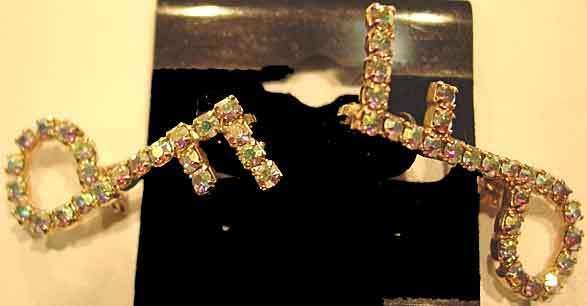 Excellent condition, clear stones are not as dark as first picture indicates. 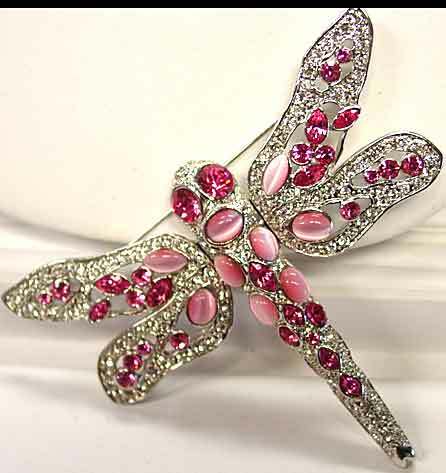 Description: Pink Glass Moonstone and Rhinestone Dragonfly Brooch - At 3 1/4" x almost 4" this piece gets noticed, but it does not give the effect of being gawdy, even at this size, because of the open sections and delicate colors. Pale pink oval and marquise cabs are surrounded by rose pink ovals, marquises and rounds, and the rest of the design is done in clear rhinestone pave. Silvertone setting. I purchased this about 15 years ago from a Canadian dealer, and it was not new then; I am guessing this is about 25 years old. This is actually marked "500" and has an unreadable signature. 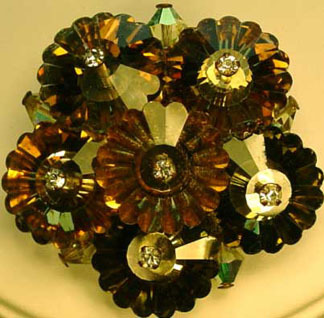 Description: Domed Brooch in Colorado and Smoked Topaz Rhinestones - Perfect for fall or anytime you wear browns, this brooch uses Colorado topaz rhinestones at the center and for the marquises along the edge, with the darker smoked topaz rhinestones connecting the lines between the marquises at the outer edge. Goldtone setting, excellent if not perfect condition, about 1 3/4" in diameter and about 3/8" deep. I have seen this same design signed Lisner but this is unmarked. 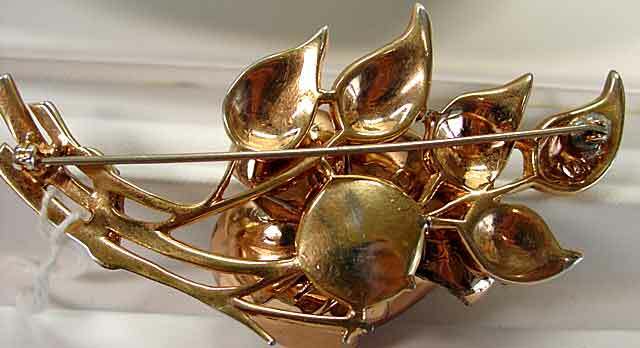 Description: Retro 3-D Floral Brooch with Moveable Leaves - This has a "Day into Night" brooch feeling to it but the petals don't close completely (please look at pictures to see the difference between fully opened and partially closed.) 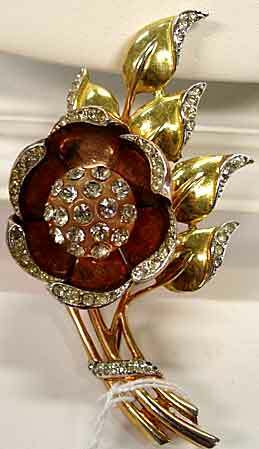 Center appears to be plastic inset with clear rhinestones, surrounded by rose goldtone leaves with paved tips. 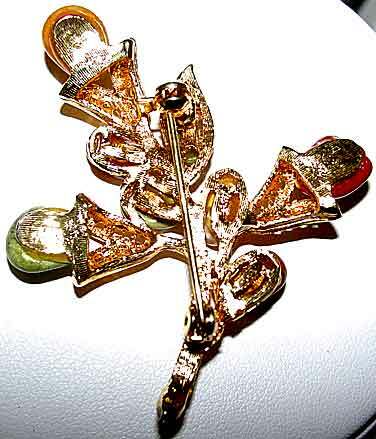 Body of the pieces is rose goldtone with yellow goldtone leaves, also tipped with clear rhinestones. 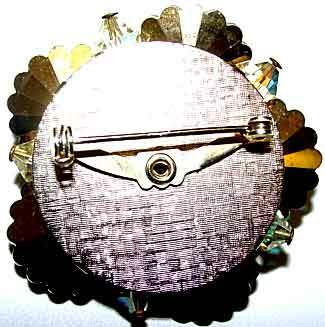 This piece screams top quality, from the individually hinged petals to the topnotch pinback mechanism. Very good condition with a slight plating rub on back and a little scratching on the rose gold petals. The petals don't seem to close perfectly anymore, (maybe I'm doing something wrong) and there is a professional solder repair on the pinstem that doesn't show or affect the performance of the piece, but priced accordingly. 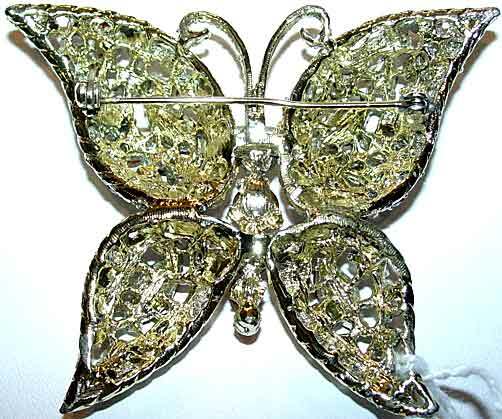 Description: Czech Type Butterfly Brooch with Multi Jeweltone Rhinestones - This pretty little pin measures 1 5/8" x 1", potmetal setting is a burnished silvertone. 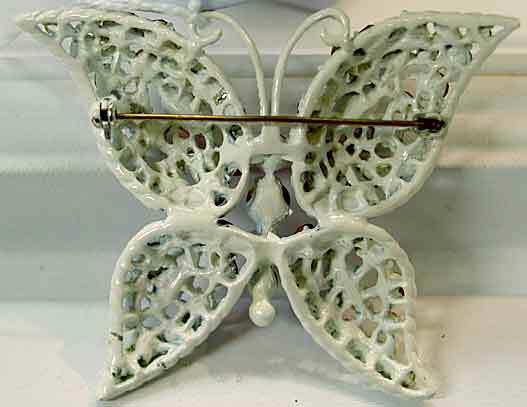 Excellent condition, great for the butterfly lover! 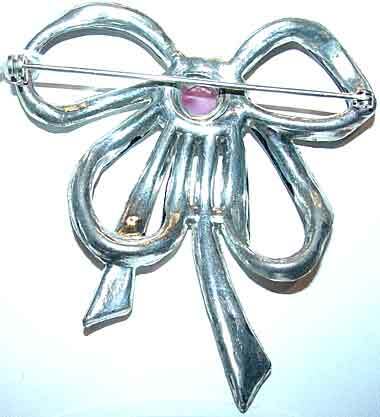 Description: White Japanned Butterfly Brooch with Multi Pastel Stones - White enameled background provides a unique background for the light sapphire, rose pink and lime green rhinestones used in this piece. 2 1/8" x 1 5/8", with domed sections to give dimensionality to the piece. Looks like some of the Weiss/Pakula/Mandle pieces I have seen but not in this color combination. 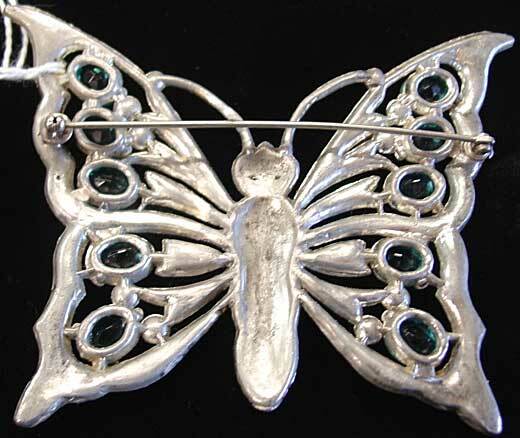 Description: Unsigned House of Schrager Butterfly - A well known design, these are apparently both signed and unsigned, though I have yet to see a signed one. 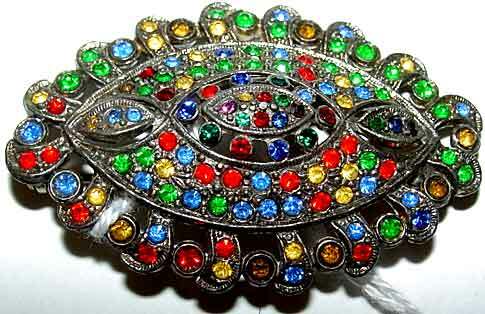 At 3 3/4" x 3", this is an imposing piece, with 10 unfoiled aqual oval glass stones, two red rhinestone eyes and a pave body. Relatively little stone darkening on the clears, really nice condition. 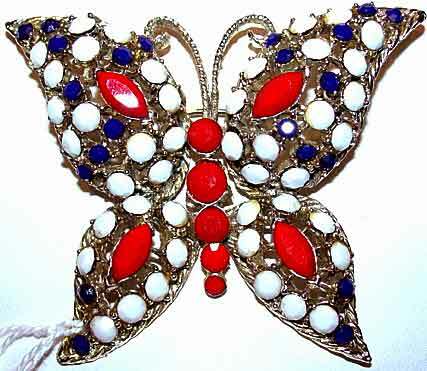 Description: Butterfly Brooch in Chalk White, Cherry Red and Lapis Blue Rhinestones - If you like patriotic colors or are a butterfly collector looking for a piece to wear for the 4th of July, this may be the piece for you! Opaque stones give this a more casual look and this would be great with denim, but also fine on a suit jacket for work or attached to a hat for a jaunty look. 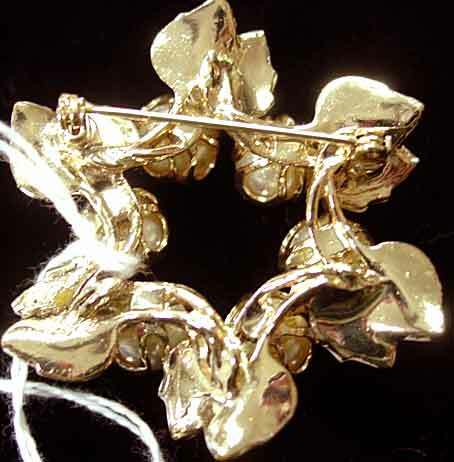 Light goldtone setting, very good condition, with only a little yellowed glue on the edges of white stones to keep this from being considered excellent condition, and this is not seen unless you are quite close and looking for it. At 2 1/2" x 2 1/4" this is a nice sized piece, not too large and not too small. 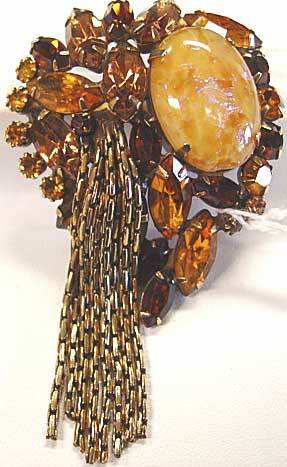 Description: Smoky/Madeira Topaz Rhinestone Brooch - This piece is done with a large octagonal cut unfoiled smoky topaz glass stone surrounded by a "swoosh" of Madiera topaz rhinestones and small goldtone etched balls. For whatever reason the reddish brown Madiera topaz stones did not photograph well, you will not be disappointed with the vibrant color in person. 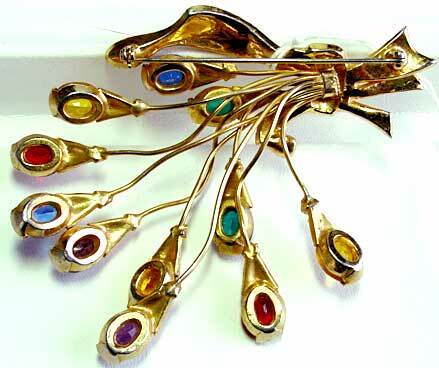 All stones are prong set and original. 3" x 1 1/4". Outside of some mild surface scratches on the "table" of the octagonal stone this is in excellent condition. 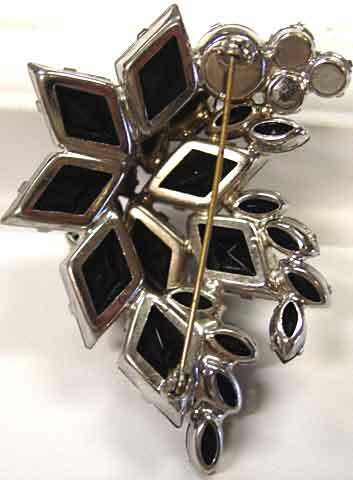 Description: Grey Faux Moonstone Pinwheel Brooch - I have always liked the faux moonstone pieces, particularly when they are in unusual colors. I rarely find grey ones, and since grey has been a very popular fashion color recently, you will probably find this will go with a number of things in your wardrobe. The clear rhinestones on the "spokes" of the pinwheel have aged and could be replaced if you want a "newer" look, but since all the original ones are there (and look better in person than in the photograph), I will leave that up to you to decide. 2" in diameter, no other condition issues here, and a great price. 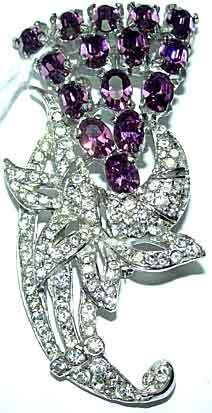 Description: Large Purple and Clear Rhinestone Potmetal Floral Brooch - While this is probably not Trifari, it certainly is a design reminiscent of Trifari and is probably a vintage copy (the most sincere form of flattery??) Almost 3 1/2" x 2", with curving floral petals that give it a 3 dimensional effect. Excellent condition, all stones look to be original and sparkling. 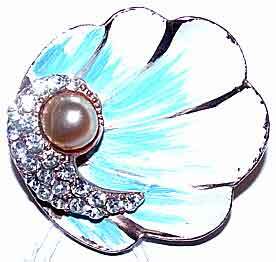 Description: Floral Brooch with Blue Faux Moonstone Cabochons, Enamel and Rhinestones - A lovely piece, very Trifari looking, but unsigned. Baby blue glass cabochons act as flowers, while green enameled leaves and brown and green enameled stems are encircled with pave set ribbon, with additional clear rhinestone accent pieces on and around the flowers. 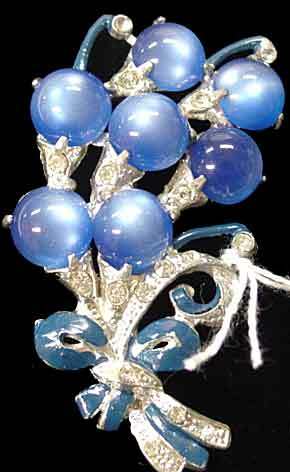 White enameled sections are also at the base of the two larger blue moonstones. 3" x 2". Condition is very good but has enamel loss on edge of left leaf (spot on right leaf is camera reflection and NOT enamel loss) and on the center stem near the bottom. One smaller blue moonstone has a scratch and one large and one small moonstone have color wear spots. As you can see from the picture the moonstone flaws are indiscernible but have to be noted for accuracy. Absolutely charming, and quite a complex piece. Description: 3-D Enamel and Rhinestone Floral in Aqua and Clear - This is a really lovely piece with a three layer floral head that has an aqual enamel top centered with a clear stone. 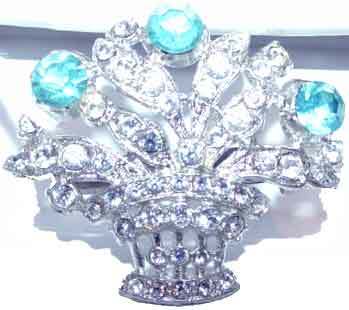 The pave set leaves end with prong set aqua teardrops, and the rest of the piece is also rhinestone set. Shiny rhodium plate, 3 3/4" x 1 1/2". Excellent original condition with some yellowing of the pave on the bottom right hand stem. 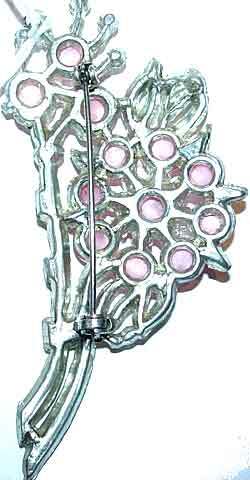 Description: Pink Faux Moonstone, Enamel and Rhinestone Floral Pin - Another charming floral, this time done in pink glass moonstones, with lots of clear pave and black enamel accents. 2 7/8" x 1 1/2". 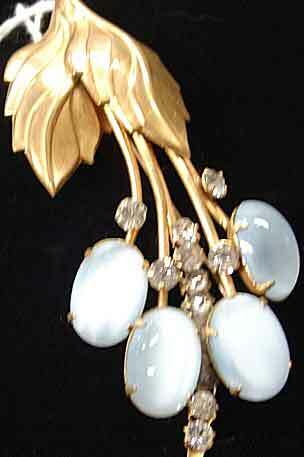 Very good condition with a couple of tiny dings in one moonstone,one replaced rhinestone and a little enamel loss. 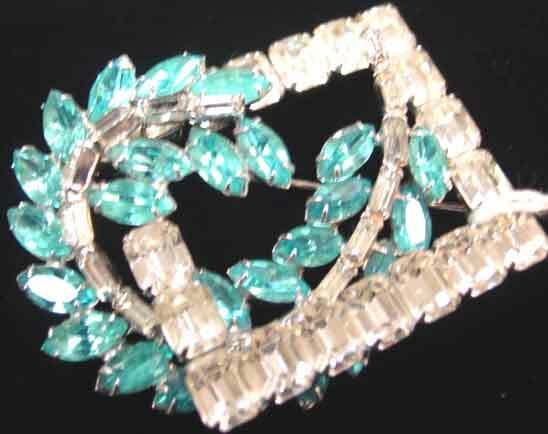 Description: Light Blue Floral Glass Rhinestone Brooch - Similar to the fruit salad pieces, this is either early Trifari or a vintage wannabe. 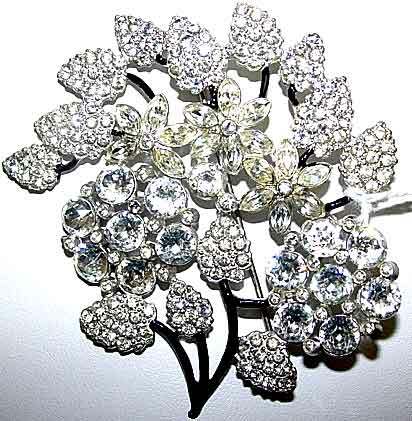 Potmetal with clear rhinestone pave, two floral glass stones and two leaf stones. 1 1/2" x 1" and very sweet. One tiny clear stone is a replacement, otherwise excellent original condition. 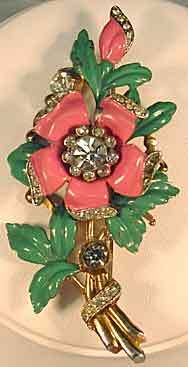 Description: Floral Brooch Multi Peach Enamel & Stone - This charming piece is a hard to find color, using a pinky-peach enamel overlaid with a tangerine colored enamel. Leaves are enameled medium and dark green. 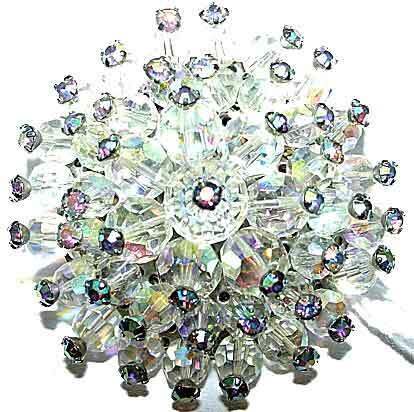 Center is set with clear round rhinestones, and top has 5 pointed top light siam marquises. The three unfoiled and prong set oval stones are a color that I will say is close to roseline, but deeper - I don't think I've ever seen this color stone before. 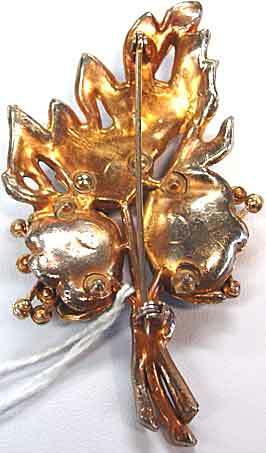 The enameling here looks typical for Coro but the piece is unsigned. 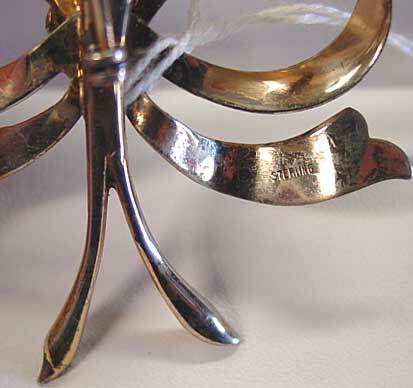 Goldtone, plating wear on back of stem that shows enamel loss, you may wish to have the stem re-enameled but the rest of the enamel, while worn at edges and a few high points, is in pretty good shape for a 70 year old piece. A nice size at 3 1/4" x 1 3/4". 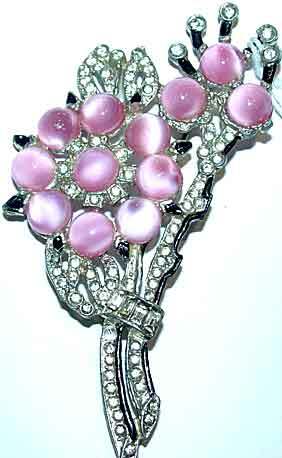 Description: Unsigned Coro Pink Faux Moonstone/Rhinestone Pin - This is almost certainly an unsigned Coro. Large but "airy" looking because of the open spaces in the design, it measures an impressive 3 1/2" x 3". Some of the clears have a tinge of yellow to them but certainly to be expected of a legitimate 70+ year old piece. Potmetal setting. A lovely design. 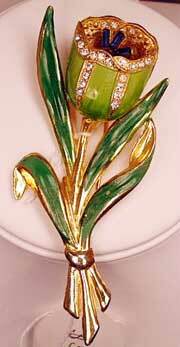 Description: 1940's Basket of Flowers Brooch - Black enamel basket with goldtone and rhinestones supports a pink rhinestone flower with green enamel leaves and two blue enamel tulips. Blue enamel is more of a light blue than the more aqua tones that show on my monitor. Some enamel loss on the high points of the blue flowers, but otherwise very nice condition. 2 1/4" x 2 1/4" and utterly charming. 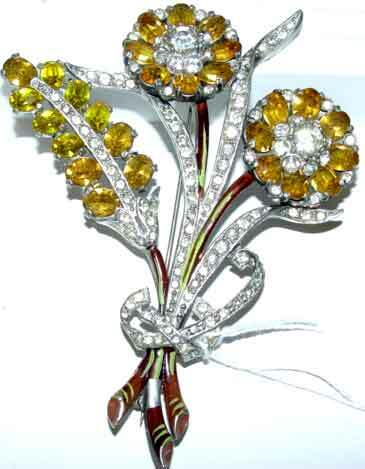 Description: Huge Multi Topaz Rhinestone Floral Brooch - Much more sparkly in person than my picture would indicate, this 4 1/2" brooch is lovely and attention-getting. 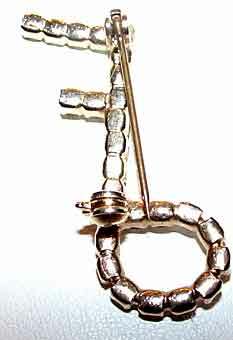 It has many of the attributes of a D&E but has the wrong type of clasp for that company. The floral head is done in three layers - notice the use of "beams" to attach layer one to two, and layer two to three. All stones are prong set. Center smoky topaz round is surrounded by a row of topaz rhinestone chain. Second layer is done with smoky topaz marquises alternating with topaz rounds, and third layer is more smoky topaz marquises set at an angle. 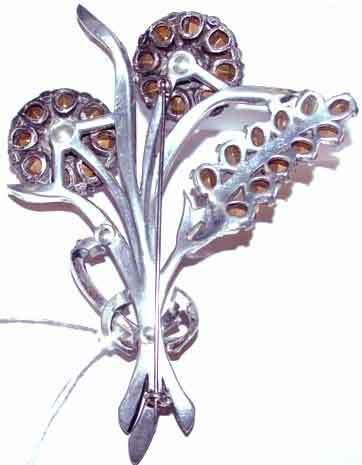 The stem is accented with smoky topaz rounds and "skinny" navettes as well as topaz rounds. Very nice condition. 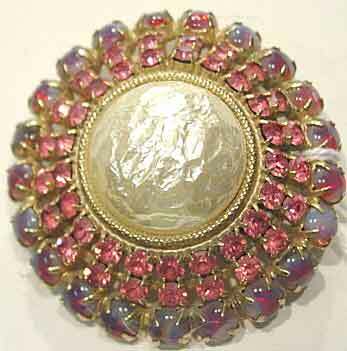 Description: Sabrina Stone Baroque Glass Pearl Brooch - This is a really pretty combination of rose pink rhinestones and round "Sabrina" glass cabochons around a center baroque style glass pearl. Goldtone setting, all but the pearl are prong set. Excellent condition - any green colors on the plating in the back view are a reflection and NOT verdigris or any damage. 2" in diameter and about 1/2" deep at largest point. Top photo is with flash, bottom is without. Color in person is somewhere in between. 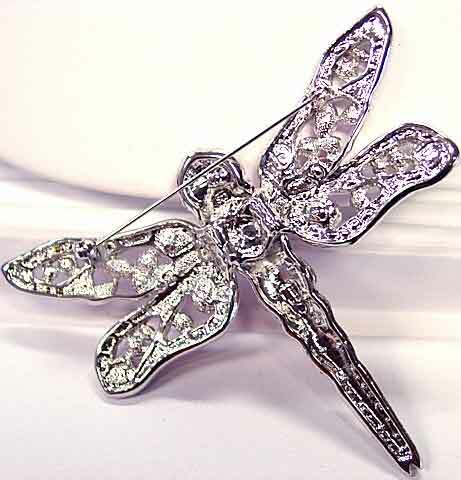 Description: Pastel Rhinestone and Enamel Trembler Brooch - Floral themed brooch has a dragonfly "trembler" in the center. Beautiful shades of pink, lavender, yellow and aqua flowers, centered with corresponding pastel rhinestones, have bright green leaves. 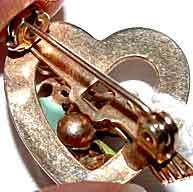 Goldtone setting, very 3-D and the trembler mechanism works well. 2 1/4" x 1 1/4" x 1/2" deep. 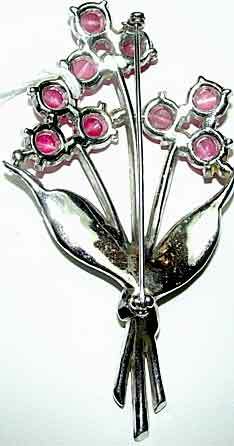 A few fleabites to the pink enamel, otherwise great shape. Beautiful AND fun! What could be better! 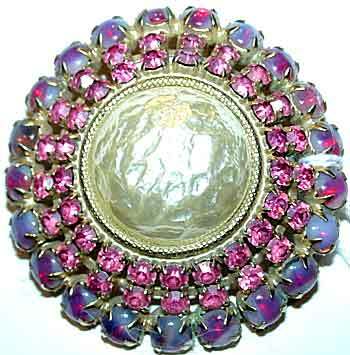 Description: Large Fuchsia Faux Moonstone Cab Floral Brooch - At 3 3/4", this is definitely a larger piece. Fuchsia cabs top brown enameled stems that are tied with a pave ribbon. 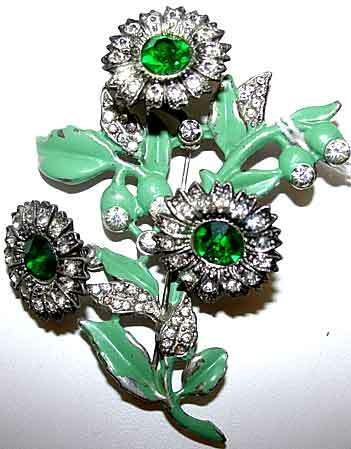 Green enameled leaves are edged with more rhinestone pave. 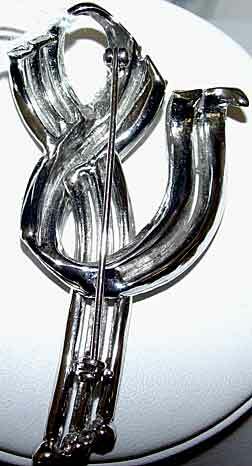 Upper and lower halves curve toward the ribbon tie. Two of the small rhinestones are replacements; minimal enamel chipping. Rhodium? plate. Made to look like Trifari and Coro pieces of this time period, and this may, indeed, be one of these two companies' production. 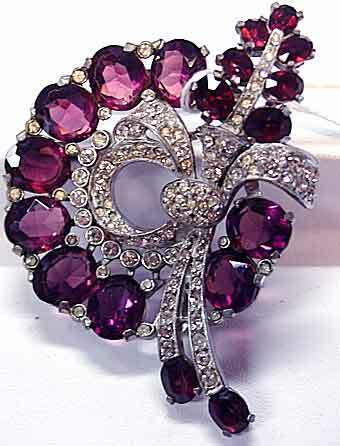 Description: Purple and Clear Rhinestone Stylized Floral Brooch - Sparkling amethyst colored oval rhinestones are set in a 5-4-3-2-1 pyramidal design above a clear pave set foliage and stem design. 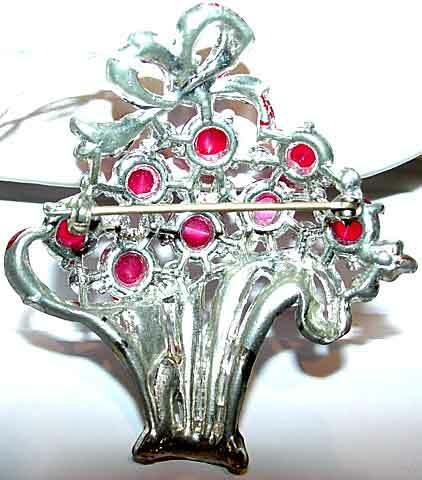 Silverplated setting, all stones appear original and everything is in excellent condition. 2 1/2" x 1 1/4". 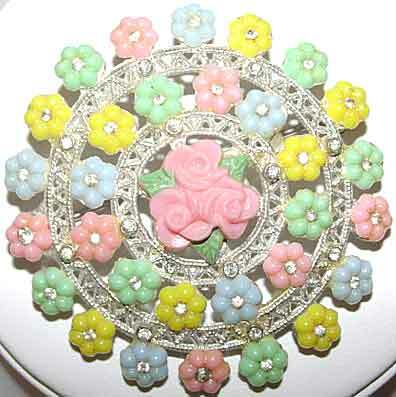 Description: Multi Pastel Floral and Rhinestone Brooch - If you find these pieces charming, as I do, you will also find this one unusual, with the cluster bouquet in the center that I have not ever seen on any of these pieces. 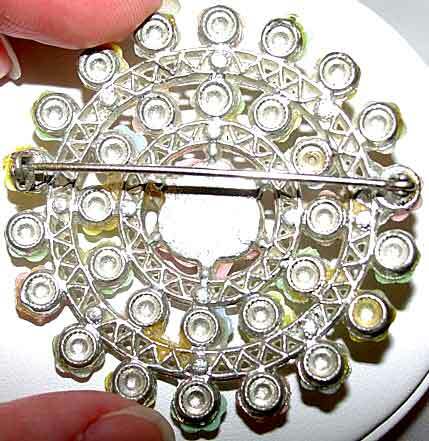 Whether the floral pieces are glass or plastic are unknown, but all of the single flowers (26 of them) have a clear rhinestone at the center, with additional small clears on the potmetal "latticework". About 2 1/4" in diameter, very nice shape, a couple of the small clears have darkened around the edges but that is to be expected of a genuine 70+ year old piece. Many collectors believe these are early Trifari (TKF) but could also be L/N, S in a Star, or other companies of that time period. 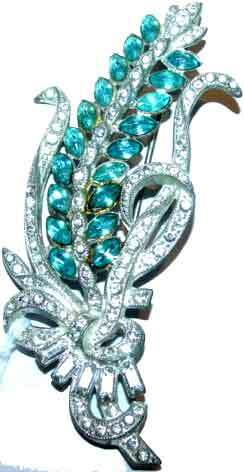 Description: Potmetal Floral with Aqua and Clear Rhinestones - Exactly the same design as the brooch above but in aqua instead of lavender. (I always enjoy finding same design-different color pieces.) This piece is in very good condition except that much of the foiling has come off of the aqua marquises. This does not in any way detract from the piece but I have priced it accordingly. About 3 1/2" x 1 3/4". It would even be fun to purchase both and wear as a set! 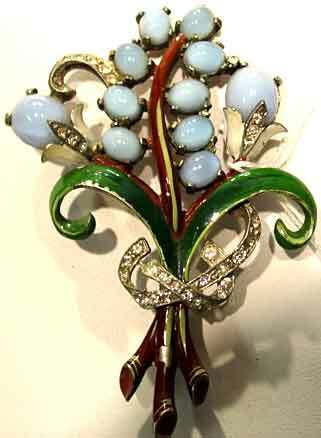 Description: Green Enamel and Rhinestone Floral Brooch - This could be considered a trembler brooch, I believe, as the blue baguette "stamens" are on a spring, however the spring is tight enough that there isn't much trembling going on. 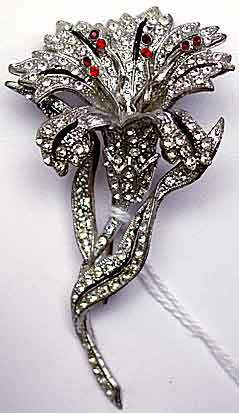 Clear rhinestones outline the three dimensional flower bud that is beautifully enameled in 1930's-1940's style. Over 3 1/2" x 1 3/4". 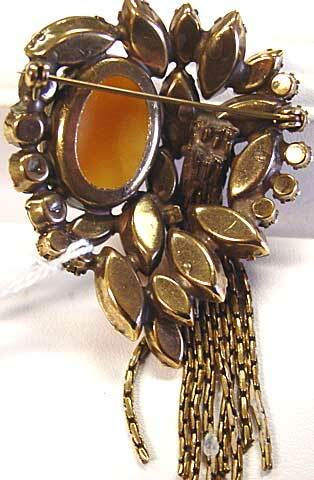 Excellent with the greens that are currently popular in fashion, and probably unsigned Coro. 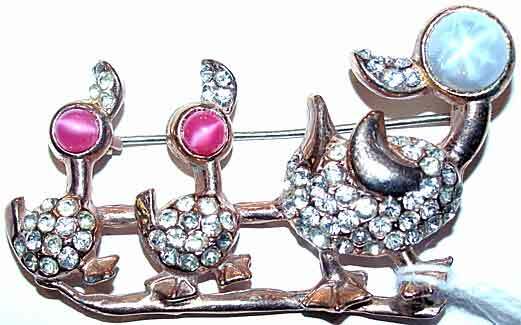 Description: Trembler Brooch with Three Heads - Tremblers are a favorite of mine and are not easy to find, particularly when the tremblers work well and there are more than one. 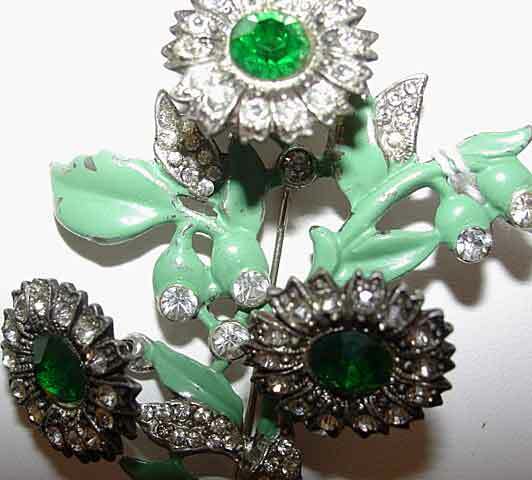 This lovely floral uses emerald green and clear rhinestones and a medium green enamel. All the stones are very bright and clear but the enamel has signs of wear. 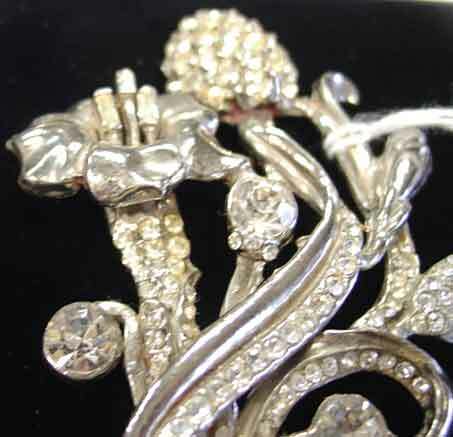 Silvertone setting is quite shiny, edges of floral heads have been antiqued, which makes them "pop". 2 1/2" x 2". 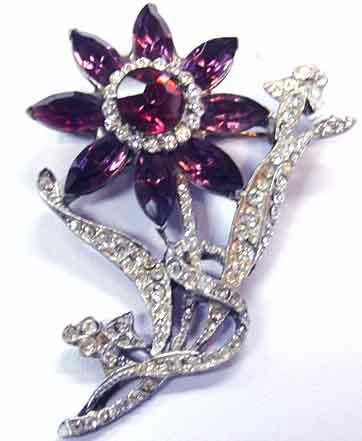 Description: Potmetal Floral with Purple and Clear Rhinestones - What a lovely design! Deep purple ovals border each side of the stem, and a bow ties it all together at the bottom. 3 1/8" x 1 1/2". Excellent condition - one clear stones appears to be a replacement but the rest appear to be original. 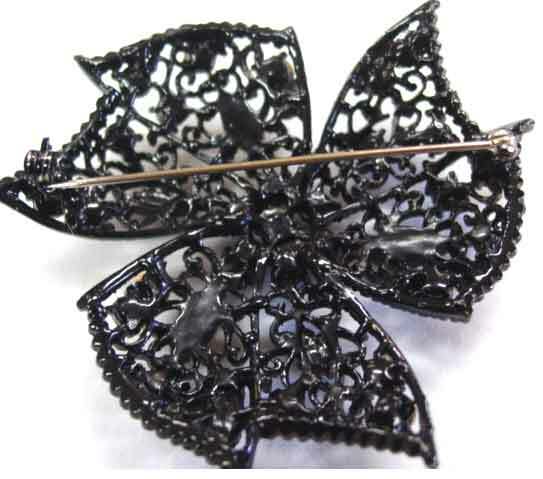 Description: Clear Rhinestone Floral Brooch with Black Enameled Stems - I photographed this on black thinking the clear stones would show up better. Well, maybe not, but perhaps you can see the design. 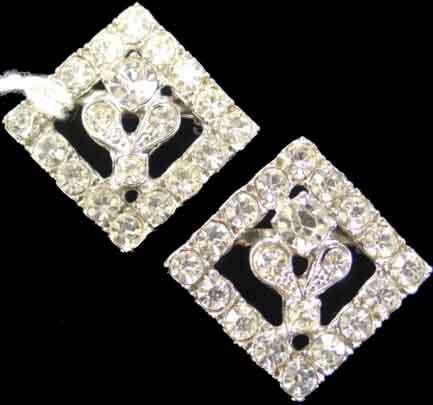 Two larger floral "heads" are made up of 7 clear dentelle cut rhinestones with tiny clears in between. Three smaller flowers are made up of small marquiese, while the 13 leaves are all pave set. 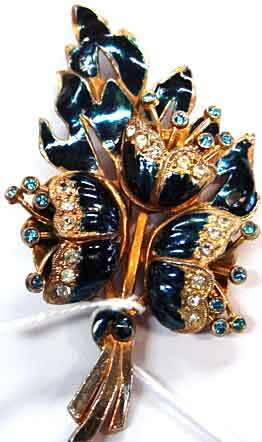 The are all black enameled and the enameling is in excellent condition. Silvertone, about 2 1/2" in diameter. 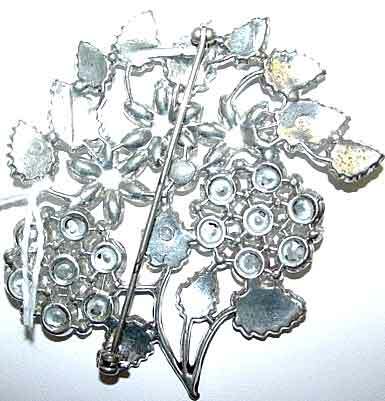 Description: Three Dimensional Potmetal and Rhinestone Floral Brooch - Ingeniously made piece with top portion having a front and back that have been riveted together and small pistils? with red rhinestone tops coming up between them. Most of the piece has been pave set with small clears and the design is very lovely, with black enameling along petal "veins". 3" x 1 1/2"; rivets are secure but top part is not very tight any more; you may wish to tighten, but I will leave that to the next owner. Description: Blue Moonstone and Red and Clear Rhinestone Floral - Top quality floral pin, done in goldtone and silvertone as in fine jewelry. 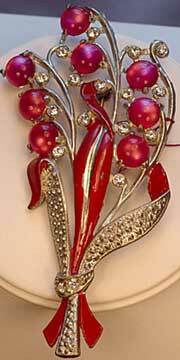 Red rhinestones are ruby colored unfoiled ovals rather than siam (fire engine) red. 3" x 1 1/2". 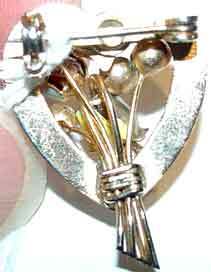 Plating is worn along edges and there is a small dark area possibly from a resoldered clasp end? otherwise in excellent condition. As a longtime Trifari enthusiast I feel this is probably Trifari, but as with most unsigned this is just conjecture and this has a unsigned price! Description: Unsigned Staret? Brooch in Deep Blue and Clear Rhinestones - I have seen this feather brooch before, both signed and unsigned, but the signed ones have always been Staret. 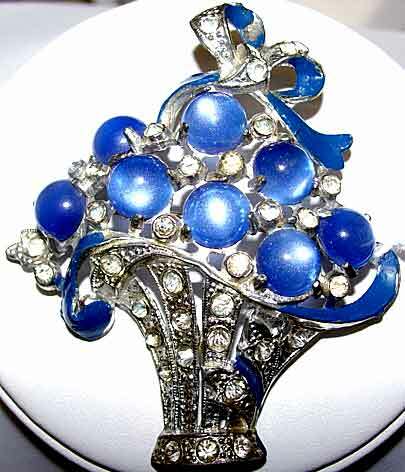 This features almost cobalt colored fire polished marquises and lots of clear stone work. Two of the blue stones are replacements but they will be difficult to find except that they aren't fire polished stones. A sizeable 3 3/4" x 1 1/2". Potmetal setting. I have been told this is an Eisenberg design but I have no proof to back that up. 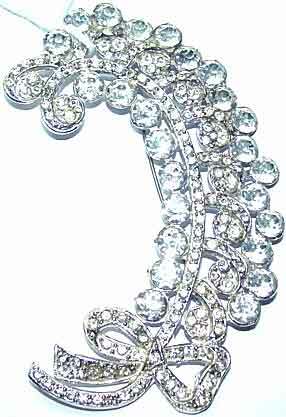 Description: Huge Plume Pin in All Clear Rhinestones - Book piece, shown in one of Cherie Simmonds books, this was also done in colored stones with clears and faux moonstones with clears. Here is the classic all clear version. 3 7/8" x 2 1/4" at widesst points. Larger stones are dentelles (fancy cut) rounds, which the remaining stones all clear pave. Approximately 150 stones, all look to be original. As to be expected in a legitimate 70+year old piece, most of the stones have darkened mildly, and a couple are quite dark, but I don't find this to be offensive but adds to the charm of the piece. 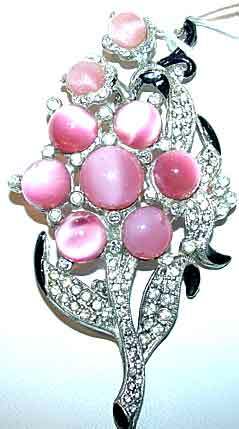 Description: Fuchsia Faux Moonstone Floral Brooch - Large 4" x 1 3/4" potmetal brooch with burgundy enamel, clear rhinestones and hobnailed metal accents. Small ding in enamel and clear rhinestones appear to be replacements (not by me), but a lovely design in an unusual color combination for the faux moonstone collector. 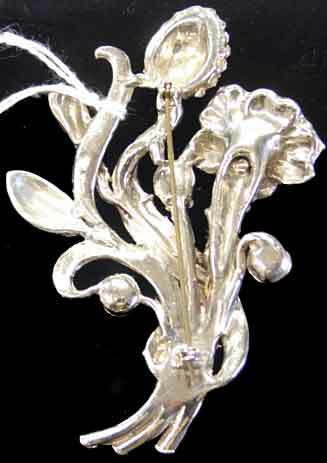 Description: Large Floral Triple Headed Brooch - - I have seen this same design signed Weiss, but this particular piece is unsigned. Done in light sapphire, dark sapphire, and Montana (navy) blue rhinestones and set in goldtone, this is extremely three dimensional and done by soldering metal circles together in back. 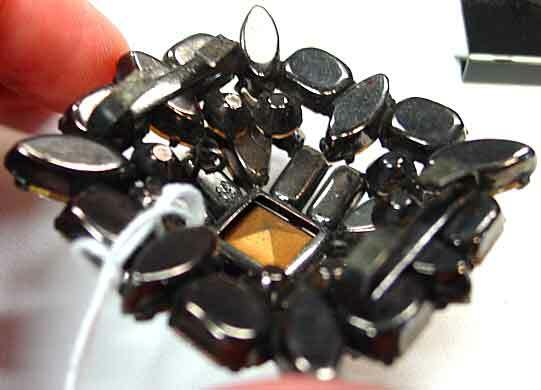 This measures about 2 1/2" in diameter; the stones are extremely bright and sparkly. The only flaw I see is a solder repair done apparently a long time ago that seems very solid and in no way shows from the front. Beautiful piece. 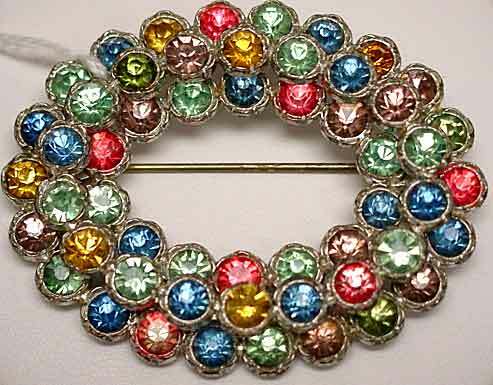 Description: Sugared "Hawaiian" Brooch - While this piece has some condition issues, it is a fun piece for casual wear and has "the look" that is hard to find. 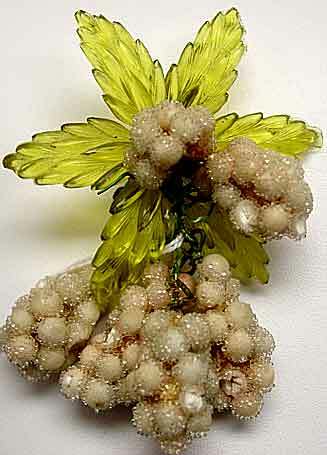 A few of the little cream colored sugared "balls" have been damaged (see picture) and the top cluster is missing some of the balls. Clasp is a little wobbly. Nonetheless this baby still has a lot of use left in it. 3 1/2" x 2". 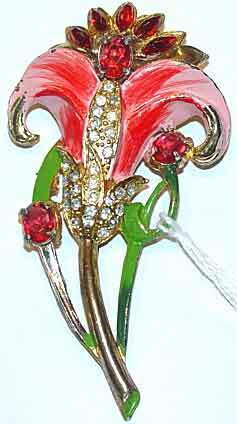 Description: Pink and Green Enameled Floral Trembler Pin - This charming piece has quite a few tiny rhinestones as accents and three relatively large clear stones. The enameled is in good but not perfect condition - one pink petal has a chipped spot and the leaves have several small dings. However for its age it still looks very good and has the added benefit of having the floral head on a spring so that it trembles while you move. Possibly Coro but unsigned. 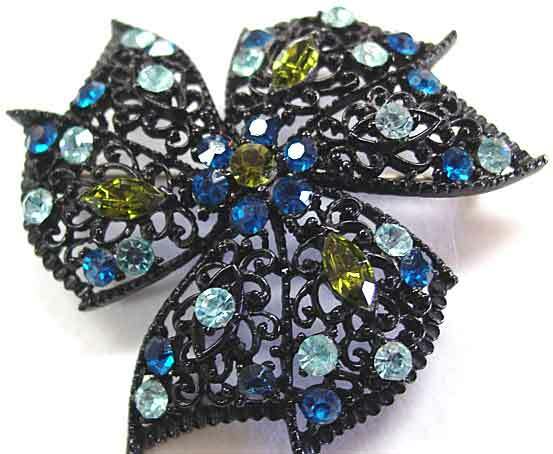 Description: Aqua and Clear Rhinestone Potmetal Floral - Beautiful design. 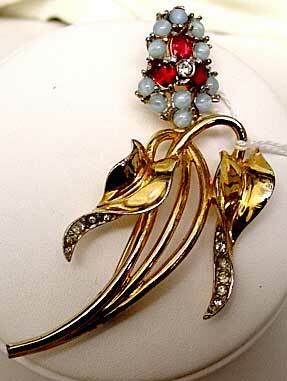 Aqua marquise Czech stones make up the floral, with clear rhinestone stem, leaves and ribbons. 3" x 1". Silvertone, potmetal. Plating is worn on back and a couple of tiny clears are replacements. Very good condition. 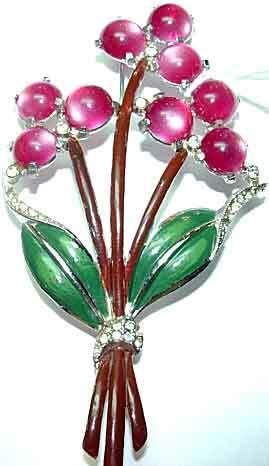 Description: Beautiful Pink Faux Moonstone Floral with Clear Rhinestones and Black Enamel - Round pink cabochons sorm the flower heads with clear rhinestones making up the leaves and stems, edged with black enamel. 2 7/8" x 1 1/4" at the widest point. 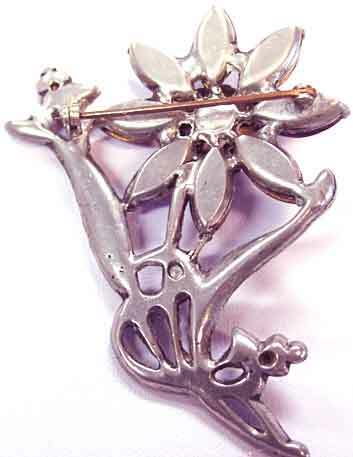 Silvertone, better quality clasp. Whether this is unsigned Trifari or simply a vintage company with a similar look will always remain unknown. As with almost any legitimate 1930's piece, this has slight yellowing on some of the clears, and one is a replacement with a clear of a similar age so it will be extremely difficult to find. Description: Long Thin Floral with Pink and Blue Faux Moonstones, Clear Pave and Black Enamel - Done in a goldtone setting, this measures 4" x 2" at the widest point. The enamel is very slightly worn, certainly commensurate with age. Circa 1940. Description: Jade? 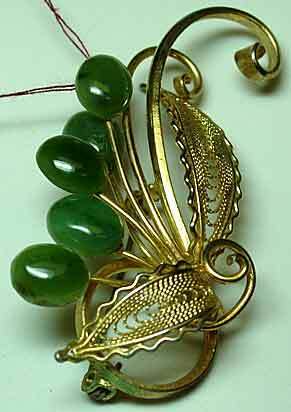 and Goldtone Filigree Brooch - I think these jade colored oval stones are glass but there is enough variation in the color to make me not 100% sure; however I have priced the piece as costume so if it's not you get a real bargain! This is a lovely, graceful design and the c-type clasp is not that old so I am wondering if this was made somewhere other than the US. 2 1/4" x 1 1/8". Goldtone is very slightly worn, otherwise excellent condition. Description: Swoboda? 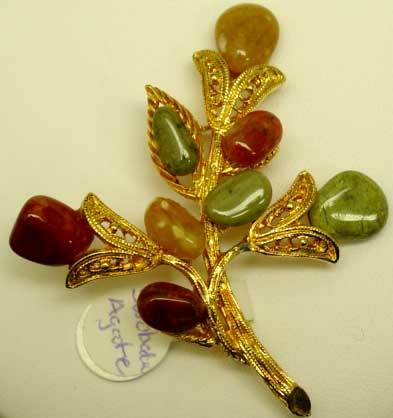 Brooch in Fall Colors - Marked simply with a three digit number (568) I believe this is a Swoboda piece and that the stones are genuine, probably agates. 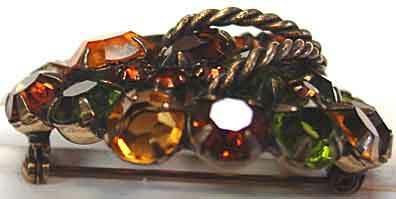 Pretty colors of tan, red-brown and green, set in goldtone. 2" x 1 3/4". 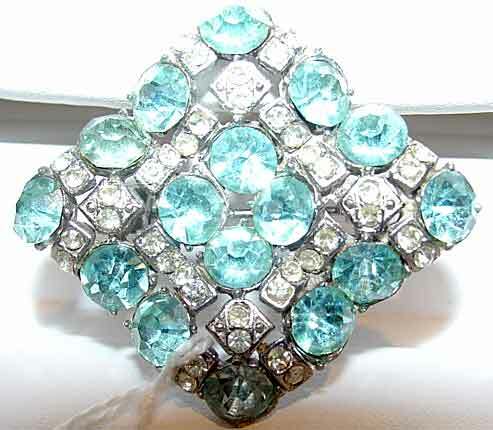 Description: Aqua and Clear Checkerboard Brooch - Or, tic-tac-toe design if you prefer! 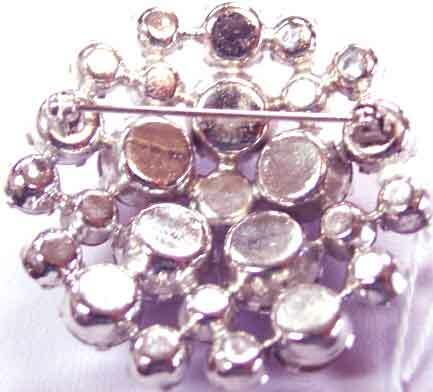 7mm rounds are separated by small cast pieces set with two rhinestones. Very interesting design, 1 3/16" in either direction, silvertone setting, excellent condition. Meant to be worn at the "diamond" shape angle instead of rectangular. Bottom stone looks very dark but that is due to a shadow that the camera operator couldn't seem to eliminate......! 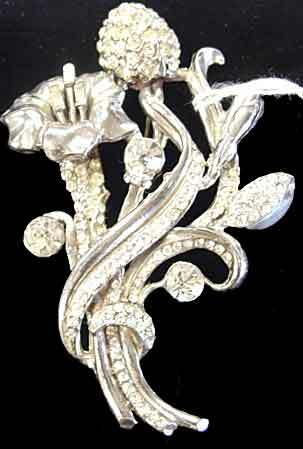 Description: Clear Baguette Waterfall Brooch - Or swirling figure 8 if you prefer. Channel set baguettes run both horizontally and vertically and alternate with round; all clear rhinestones, all paste set. 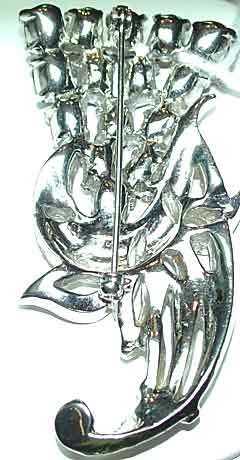 Rhodium plate, lovely design. Even more elegant in person. 2 3/4" x 1 3/8". Excellent condition. 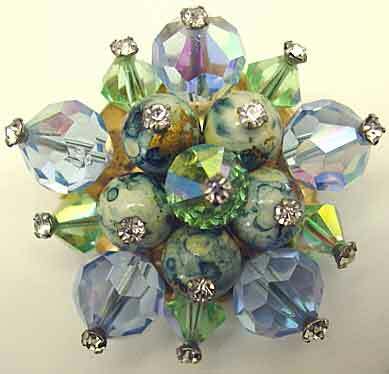 Description: Crystal Bead Brooch - This uses light sapphire and lime green crystal beads, as well as a mottled bead in shades of blue and gold, all held in place with clear rhinestone headpins, handwired into a goldtone setting. About 1 3/4" in diameter but looks larger because of the dimensionality of the beading. Lovely color combination sure to look great with almost any pastel clothing. I have seen signed Hobe pieces almost identical to this. 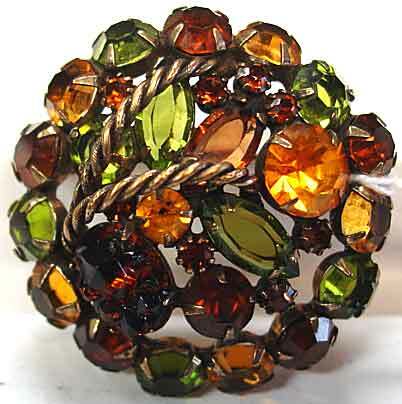 Description: Cupcake Rivoli Brooch in Autumn Tones - Marguerita beads in golden topaz, Colorado topaz and olivine shades that seem to change depending on type of lighting, Each 3/4" bead is held in place by a clear rhinestone headpin, and are separated around the edges by clear aurora borealis bicone beads. Base is round but design is pentagonal. About 1 3/4" in diameter. 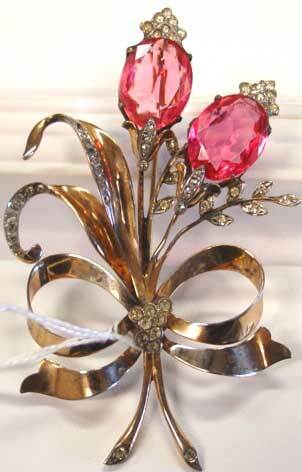 A nice size for combining with other brooches in a grouping. 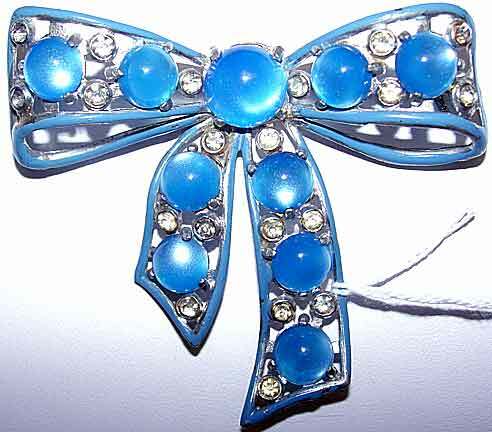 Description: Sapphire Blue and Clear Rhinestone Cleavage Pin - This long, thin brooch is perfect for going in the center of your favorite special occasion dress at the point of a v neckline. 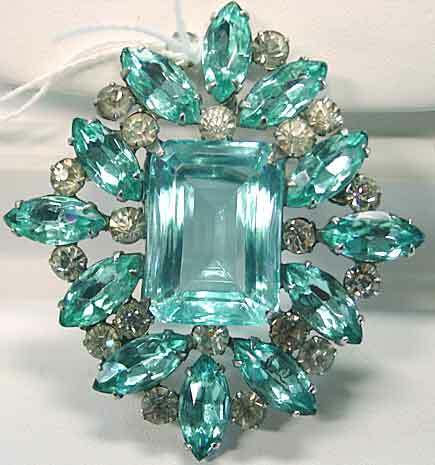 A row of channel set square blue stones is flanked by double rows of clear rhinestones. 2 3/4" x 5/8", slightly curved, potmetal setting. Extremely sparkly and in excellent condition. 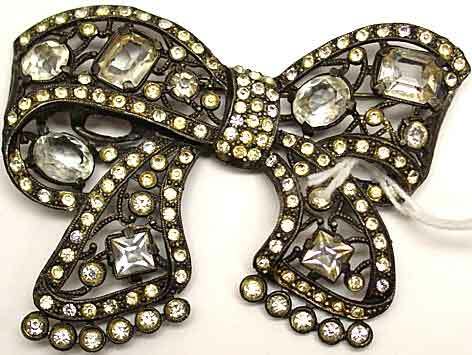 Description: Haskellesque Faux Duette Brooch - This intriguing piece is made to look like Haskell but is not; it also looks almost like a duette, but is a brooch. 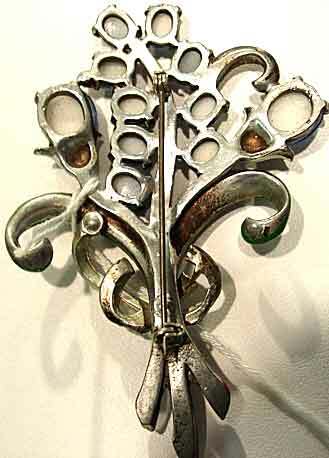 Double filigree back, cast metal pieces are pave set into graduated volute-motif sections that end in channel set baguettes. 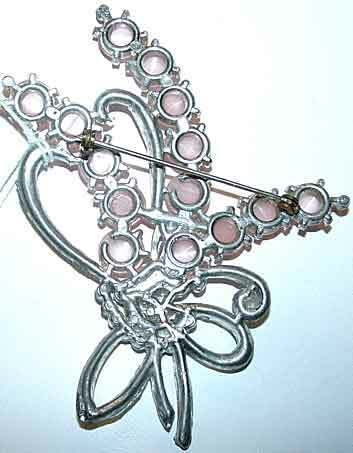 Glass pearls in center and at either end are held in place with rhinestone headpins. 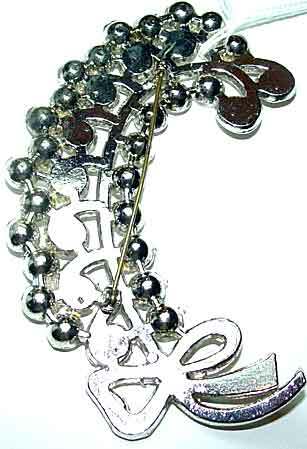 The rest of the brooch is bordered with bullet shaped transparent beads in black diamond that give a kind of ruffly look. Quality components - Robert? Jonne? Eugene? About 2 1/4" x 1". Very good condition with wear to the center pearls and a tiny bit of verdigris on the underside of the rhinestone headpins that I am reluctant to address due to the proximity of the pearls. 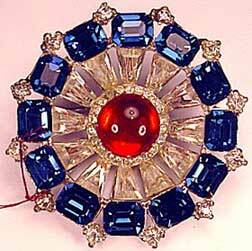 Description: Red Clear Blue Kite Stone Brooch - Center red cabochon is surrounded by a single row of small clear rhinestones, and then a row of clear kite-shaped rhinestones are curved up to meet the top row of deep blue emerald cut rhinestones. Final outside row is small clear rhinestones. 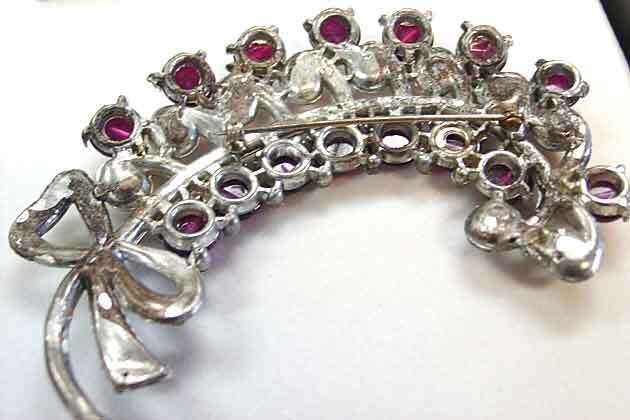 Heavy rhodium plate, original stones, designer quality, excellent condition. 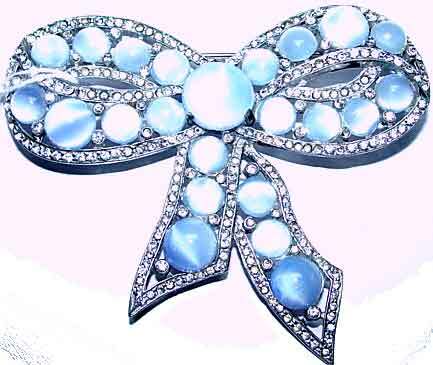 Description: Wonderful Baby Blue Faux Moonstone Bow Pin - Probably a little lighter blue in person than what my monitor indicates, this uses graduated sizes of faux moonstone cabochons to fill the design, and then lots of tiny clears to border and highlight. Silvertone setting. I have replaced one tiny clear, the rest appear to be original, some have yellowed or greyed but it does not detract from the design. At 3 1/8" x 2 5/8", this is an attention getter. 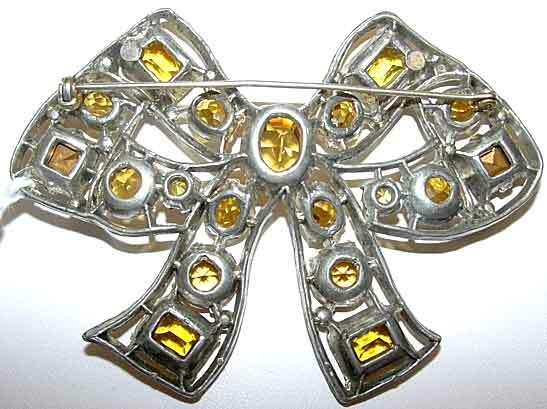 Description: Pave Set Bow Brooch - Heavy, quality piece with 3-D design and some cutwork. 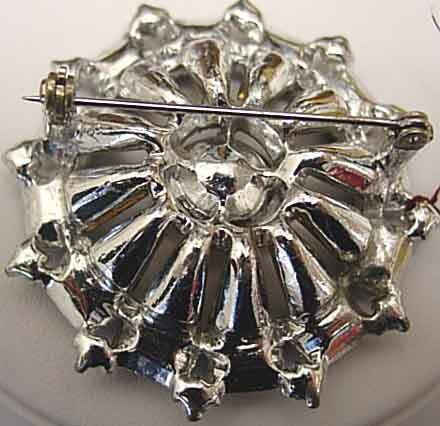 2 3/8" x 1 5/8"; all paste set clear round rhinestones. 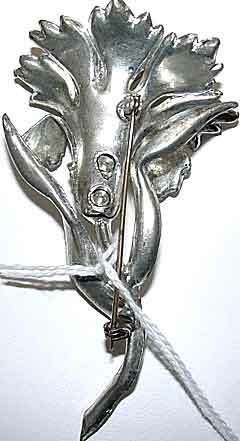 This piece would be equally at home on a garment or affixed to a hat, purse, belt, etc. Instant glam for pennies. 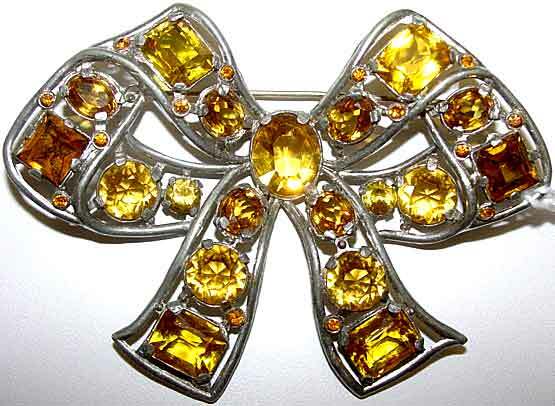 Description: Wonderful Unfoiled Topaz Glass Bow Brooch - This certainly is the stone quality and pronging that one finds in Eisenberg, and the design is certainly very similar to signed Eisenberg bows, but no signature. All stones are pronged except the tiny rounds; all the large stones are unfoiled except the squares. 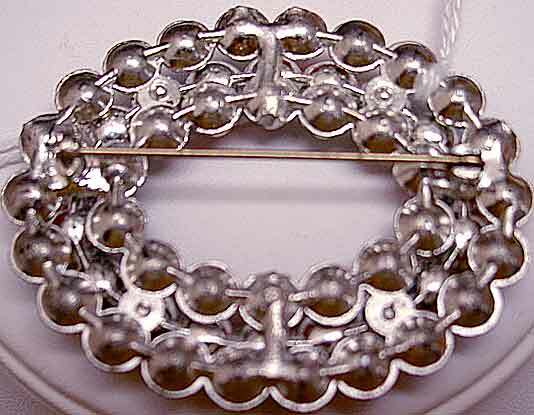 Rounds are dentelle (fancy) cut, as are the smaller ovals. Excellent condition, 3" x 2 1/4". Potmetal setting. 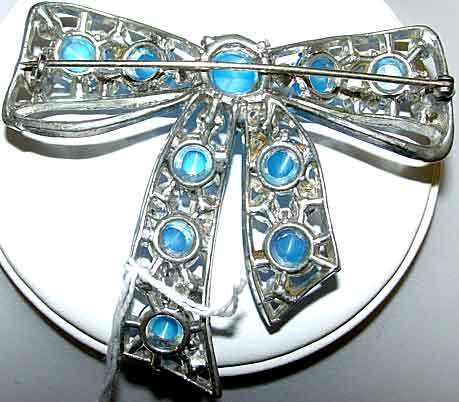 Description: Blue Moonglow (Faux Moonstone) Clear Rhinestone and Enamel Bow - This is almost undoubtedly Coro but I cannot find a signature.Nice medium blue with blue-grey enamel; everything appears original and in very good condition with some slightly enamel loss on right bottom edge. Stones have yellowed slightly concurrent with age. All in all really excellent shape for a 70 year old piece. 2 3/4" x 2 1/2". 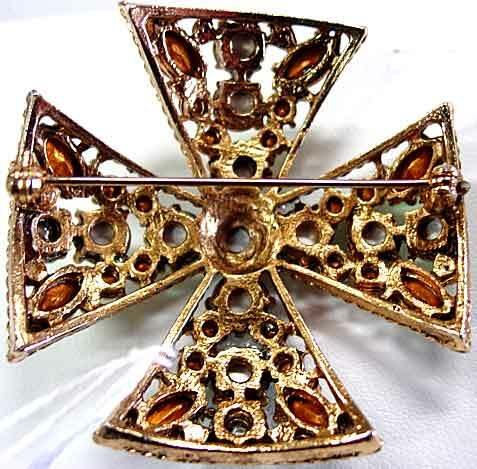 Description: Unsigned Eisenberg Bow Brooch - This has been attributed to Eisenberg; it is definitely old, though this design has be reproed (please see 2nd pic with colored repro). 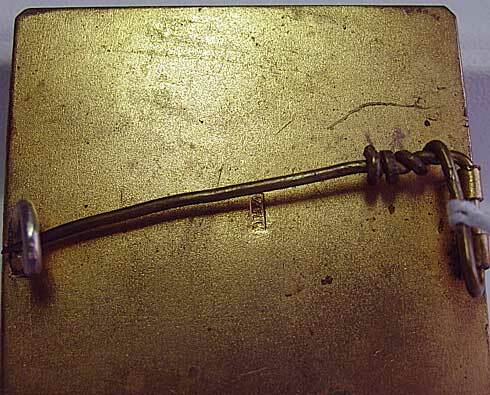 Large stones are prong set and appear to be unfoiled, though this may simply be that the foiling has worn off over the years. Some of the smaller round clears in the border and center of the bow were missing and have been replaced. Original is larger than the repro; 2 3/4" x 2". Metal may have been darkened but may be dark just from aging of metal, but a "japanned" effect results whether intentional or not. Repro is for sale in the special occasion section of the contemporary jewelry portion of the site. 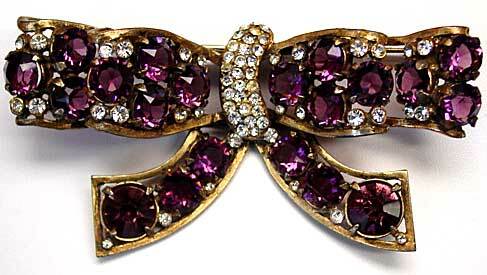 Description: Unsigned Purple and Clear Rhinestone Bow Brooch - It is my feeling that this is probably Eisenberg. 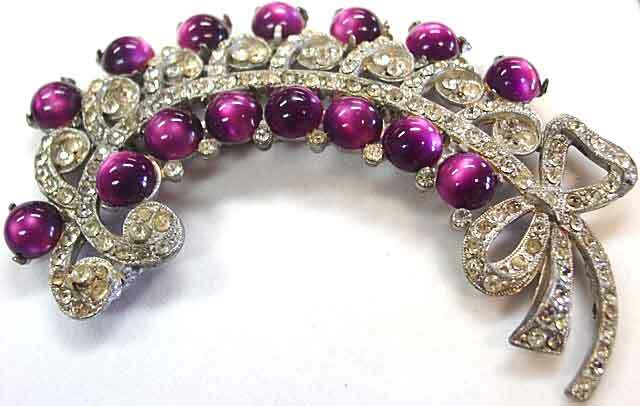 Absolutely wonderful piece; all purple stones are openbacked and pronged and only the two largest at each end of the bow ties are foiled. The clears appear to have several replacements. 3 1/2" x 2" and very 3-D (there are two loops on either side, which is somewhat difficult to see in the photo.) There is only ONE reason that this didn't jump into my personal collection, and the reason is is that I already have this one and don't need two. Buy it fast before I change my mind on that, too! 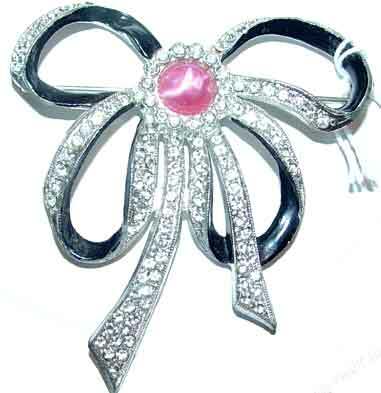 Description: Pink Faux Moonstone, Black Enamel and Clear Pave Bow Brooch - Very pretty bow in excellent condition. 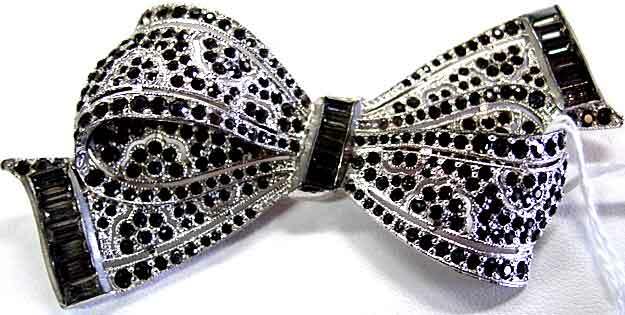 Black enamel forms "shadows" on inside of bow loops, pave rhinestone form the outer parts of loops. 2 1/8" x 2". 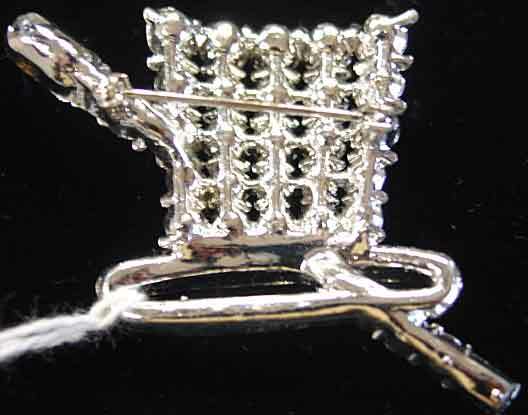 Description: Tiny Basket Pin with Blue Square Stones - If you know a basket collector, this would be a fun addition to their collection. 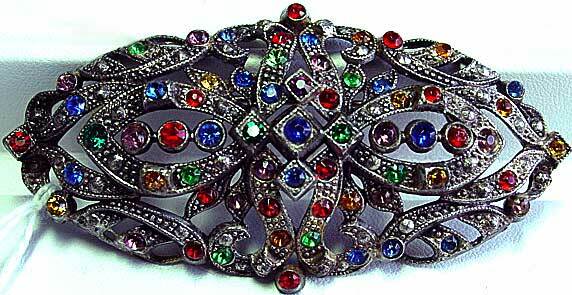 Potmetal, clear rhinestone pave accented with a blue square glass stone band, and multi jewel tone floral upper. 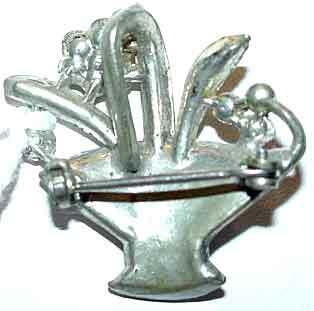 Basket handle is 3-D and may even be usable as a pendant. 1 1/8" x 1". One stone on the handle has darkened, you may wish to replace. 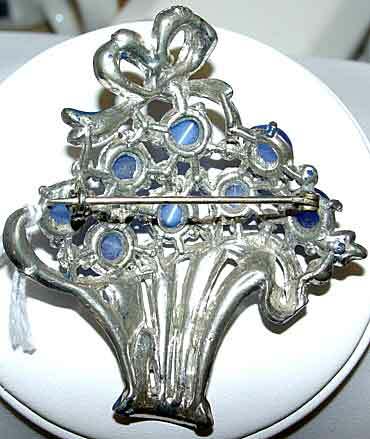 Description: Unsigned Coro Basket Pin with Blue Faux Moonstone Cabochons - Almost certainly Coro but no signature. Basket features moonstone cabs, clear rhinestones and dark blue enameling. Other than some peeling of the enamel on the top loop everything is in excellent shape. Potmetal setting, paste set rhinestones. 2 5/8" x 2 1/8". 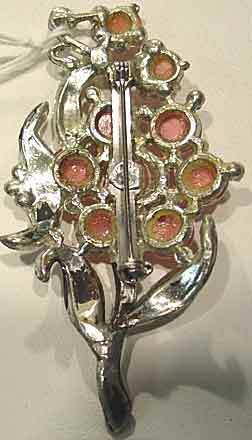 Description: Unsigned Coro Basket Pin with Fuchsia Faux Moonstone Cabochons - Identical to UP5-390 except in a different color, almost certainly Coro but no signature. 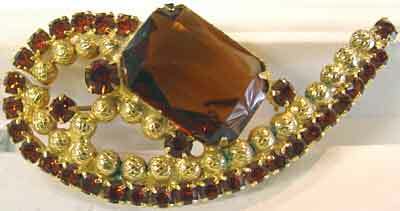 Basket features moonstone cabs, clear rhinestones and burgundy enameling. Excellent condition with a little tiny ? stuck on one enamel ribbon. Potmetal setting, paste set rhinestones. 2 5/8" x 2 1/8". 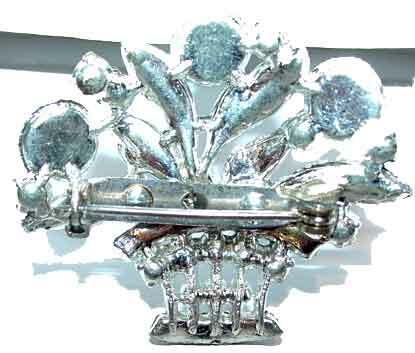 Description: Potmetal and Clear RS Flower Basket Brooch - Sizeable for this type of genre at 2 1/4" x 1 3/4". 2-3 stones appear to be replacements, otherwise all original and in excellent condition. Flower baskets were a favorite them in the 1930s-40s with the motif appearing in all types of household items as well as jewelry. A sweet reminder of simpler days. 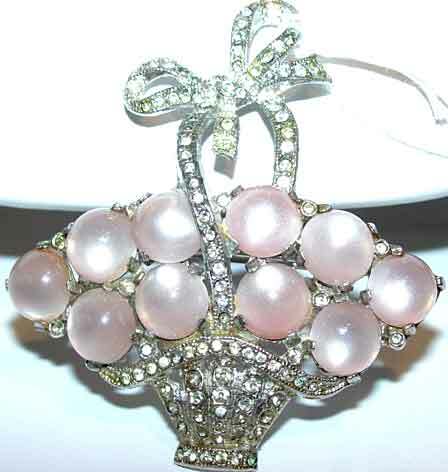 Description: Unsigned Basket Pin with Pale Pink Faux Moonstone Cabochons - Lovely basket brooch with blush pink glass moonstone cabochons and a myriad of clear rhinestone pave from the box to the basket handle to the basket and sprinkled in between the moonstone "flowers". All stones appear original but there is greying commensurate with a legitimate 1930's piece. Potmetal setting, 2 1/4" x 2", beautiful design. 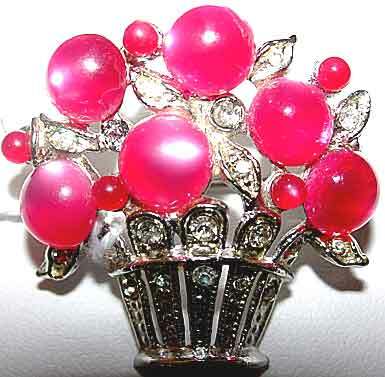 Description: Fuschia Moonstone and Clear Rhinestone Basket Brooch - This little cutie is a nice addition for the basket pin collector. About 1 1/8" in both directions. 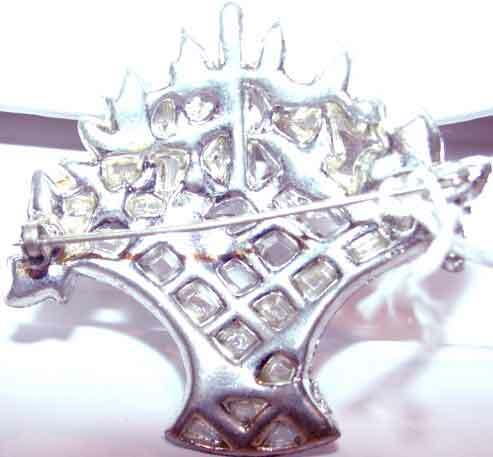 Potmetal setting; one rhinestone appears to be a replacement. 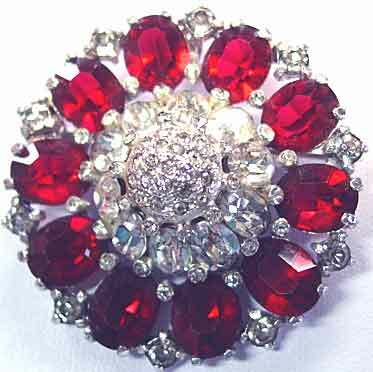 Description: Red Gumdrop Cabochon & Clear Rhinestone Basket Brooch - Beautiful lattice design is accented with 10 gumdrop cabs in ruby red glass, the rest of the piece is done with clear rhinestones. Potmetal, excellent condition, 1 7/8" x 2". 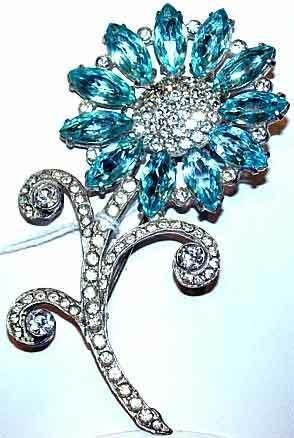 Description: Small Basket Brooch in Aqua and Clear Rhinestones - Very pretty little piece for those who love a smaller brooch, this is 1 1/4" x 1 1/2", silvertone with all clear rhinestones and three larger aqua rhinestone "flowers". Excellent condition. 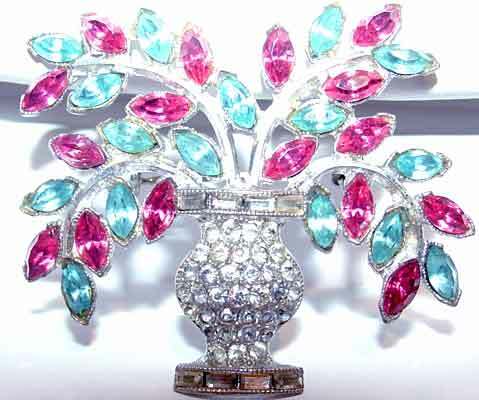 Description: Aqua/Pink/Clear Rhinestone Floral Urn Brooch - Whether you think of an urn or a vase of flowers, this piece is utterly charming and so 1930's looking. Pink and aqua marquises make up the foliage and the clear rhinestone are pave set on the urn, with small baguettes at the top and bottom. 1 1/2" x 1 3/4", all appears original and excellent condition. One of my favorites. 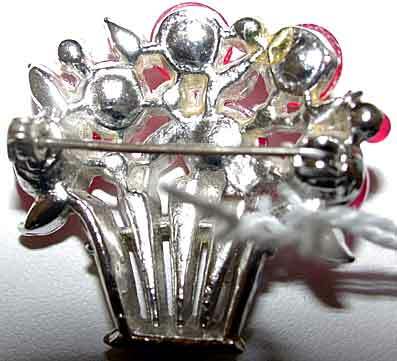 Description: Majorette Brooch - Dujay designed a majorette pin clip that is found in the Brunialti's American Costume Jewelry books, with glass pearl head, different enamel colors and a slightly more elaborate uniform . 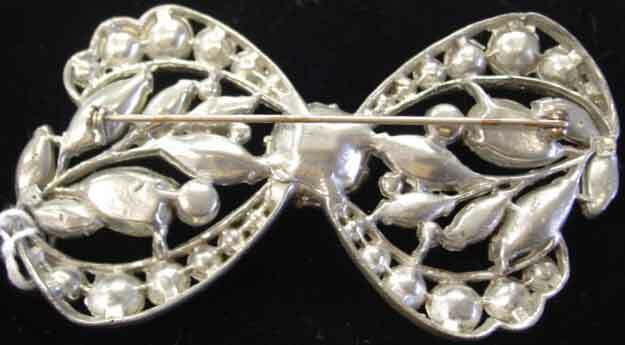 This appears to be a period copy, definitely old and NOT a contemporary repro, but this is not a pin clip, but a brooch. 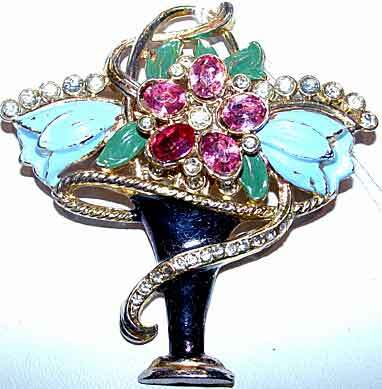 All stones are present except for one small rhinestone on top of the baton. Measures 2 1/2" by almost 1" at widest points. Enameling is 99% intact with small ding on "skirt" and hat; if there was initially enamel on the left sleeve it is now gone, but doesn't appear to have been. This would make a wonderful gift for someone who has been a majorette or has special connections to marching bands. 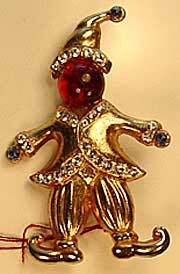 Description: Dutchman Pin - Identical to the male figure in the Coro Dutch couple duette featured in the Brunialti's first costume jewelry book, this little guy has a red glass cabochon head and small blue cabochons for hands and the tassel on his cap. Clear rhinestones line his jacket and his cap. About 1 3/4" x 1". 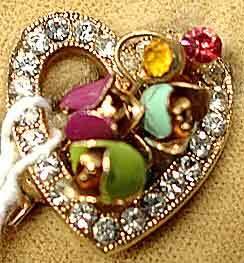 Description: Small Heart Brooch with Rhinestones and Enamel - Tiny 3/4" x 3/4" brooch with paste set rhinestones in clear going around the perimeter, and the central flowers are enameled in pastel shades, with small goldtone interior petals. 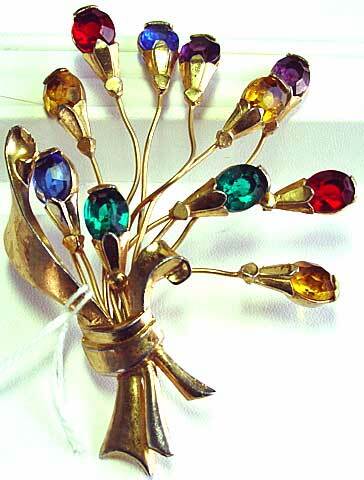 Paste set colored rhinestones and enameled flowers are on individual goldtone stems. Hearts and flowers for you! Pretty in a grouping or just plain sweet all by itself. 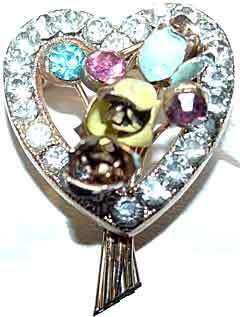 Description: Small Heart Brooch with Rhinestones and Enamel - Almost identical to UP4-302, this uses aqua, pink and purple rhinestones along with the clear rhinestone border, and yellow, cream, and aqua enameling. Possibly children's jewelry. Stems are slightly longer on this piece. Buy both (sold separately) and have a really adorable set of twin pins. 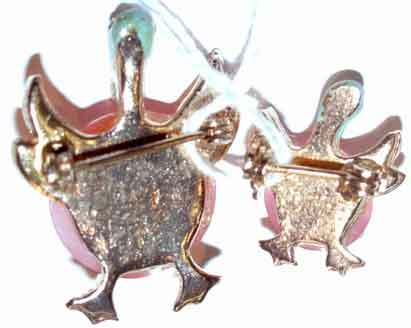 Description: Set of Two Mama & Baby Duck - Okay, I THINK these are ducks because of the webbed feet, but my husband says pelican, so, you decide! 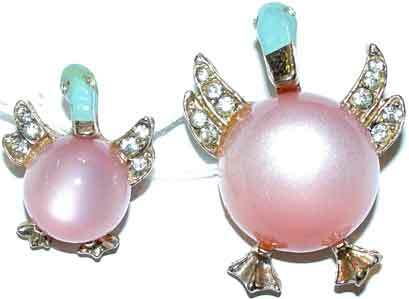 Pink faux moonstone bodies with clear rhinestone set wings and aqua enameled heads with clear rhinestone eyes. Goldtone, mama is 1 1/8" x 1" and baby is 3/4" x 5/8". I am guessing that these are children's jewelry from circa 1950. Very little children's jewelry survives for obvious reasons and is a charming genre; even more rare, these are in excellent condition. 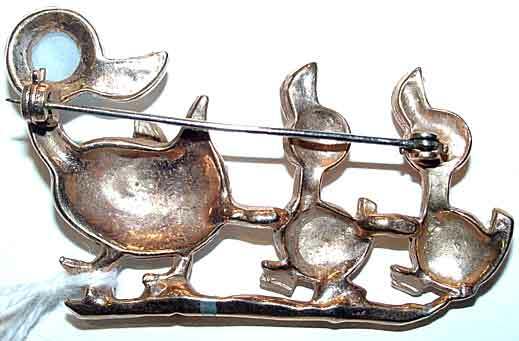 Description: Mama & Baby Duck Pin with Faux Moonstone - One of the sweetest figural pins I have had; this uses clear rhinestone pave for the ducks' bodies and beaks, while the heads are done in rose-pink and light blue glass moonstones. The mama's head is even more unusual in that it is a high domed cabochon with almost a "star sapphire" effect. 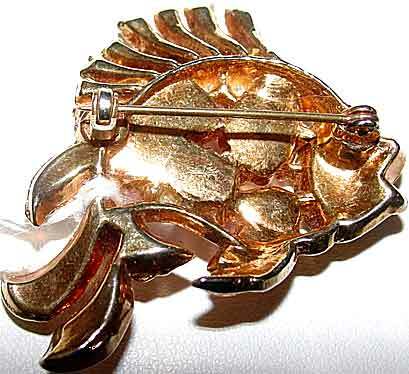 Rose gold colored plating, wonderful condition, about 2 1/4" x 1". This would make a lovely gift for an elementary school teacher or anyone who collects animal figurals. 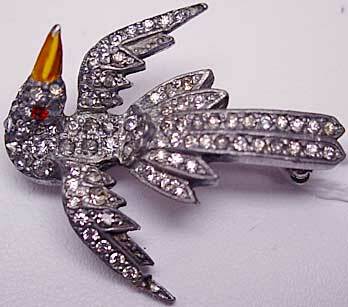 Description: Left-Facing Potmetal Bird Brooch - Another popular bird from the past, this one has all clear rhinestones except for a red rhinestone eye (what looks like a thorn sticking out of the head is actually a rhinestone that has picked up a weird reflection.) 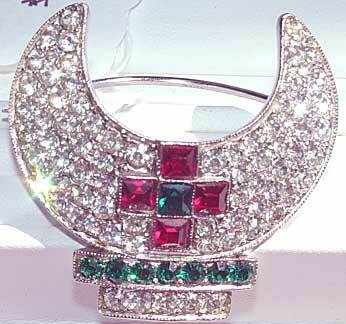 All stones are there, a few are replacements and the clasp has been professionally repaired. 3 3/4" x 2 1/4". Somewhat three dimensional; nice design. 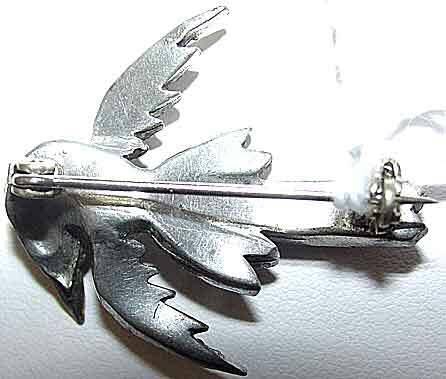 Description: Small Bird Pin with Enameled Beak - The potmetal birds that look back over their shoulder are not nearly as common as their more flat counterparts. This 3-D cutie is pave set with clear rhinestones (one small one is missing at the end of the left wing, which we will replace if you so desire. )Enameling is in very good condition with just a slight chipping at the end. 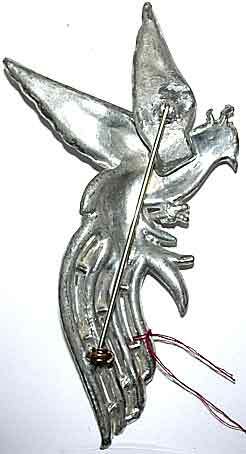 A great present for the bird pin collector. 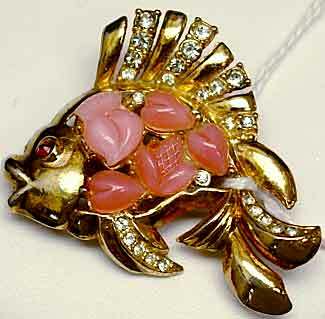 Description: Fruit Salad Fish Pin - Our gold-plated "fishie" has clear rhinestones and pink fruit salad pieces. 1 3/4" x 1 1/2". Cute by himself or as part of a grouping. 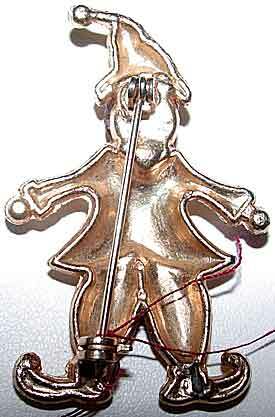 If you're angling for a fun figural, hook this baby! 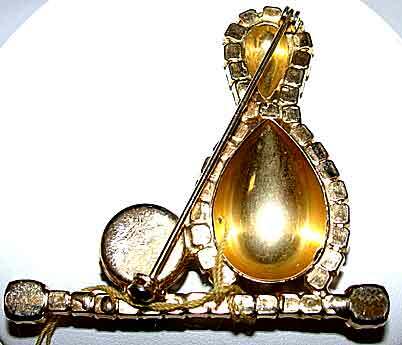 This has been identified as unsigned Trifari by some but I have not had that confirmed. Description: Enameled Shell Brooch - What kind of shell this is is unknown to me but the enamel work reminds me of pieces of Deja that I have had. Dark cream glass pearl in center is in excellent condition. Clear pave work accents the entire piece. Dark coppery colored metal is very heavy. About 1 1/2" in diameter. Except for some very minor enamel loss around the very edge this is in excellent condition. Description: Fun AB Rhinestone 16th Note Pins - Actually these are probably best described as "twin pins" because they are identical. 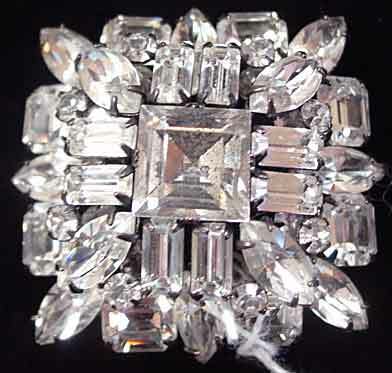 All prong set rhinestones in clear aurora borealis, set in goldtone, excellent condition, 1 1/4" x 1". 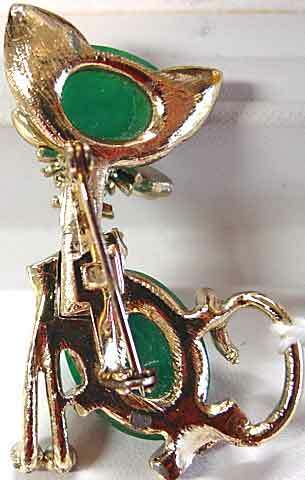 Great for the musician in your life! Price is for the pair. Please note these are PINS, not earrings. 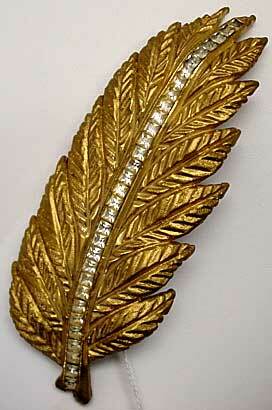 Description: HUGE Gilt Leaf Brooch - I like big, so when I say huge, well, it's big!! 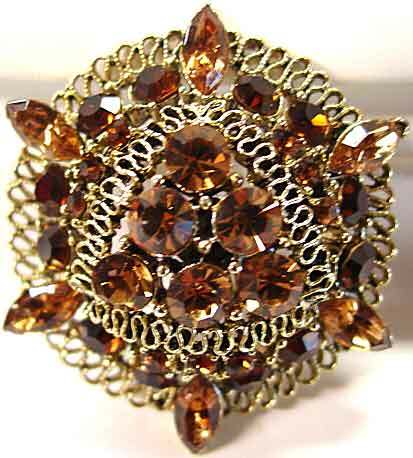 5 1/4" x 2" with channel set square clear rhinestones running down the center. A fun piece guaranteed to get people's attention. 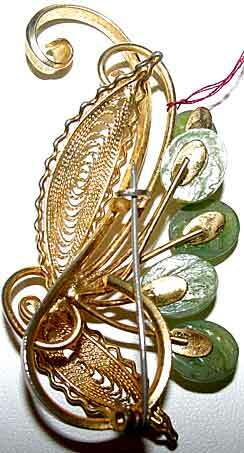 Description: Unsigned Haskell Brooch with Green Beads - This looks to be a slightly less ornate version of a brooch shown in one of the Larry Austin watercolors for Haskell. 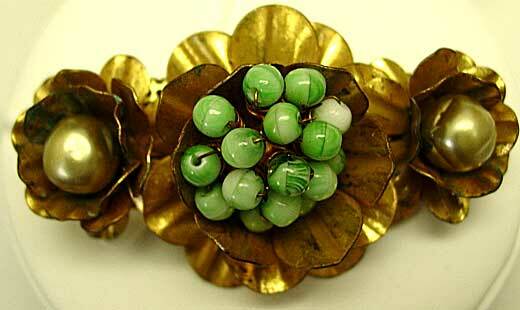 Small green/white swirled beads are hand-wired in a semi-ball shape in the center, flanked by two deep gold colored baroque glass pearls and centered in brass leaf findings. 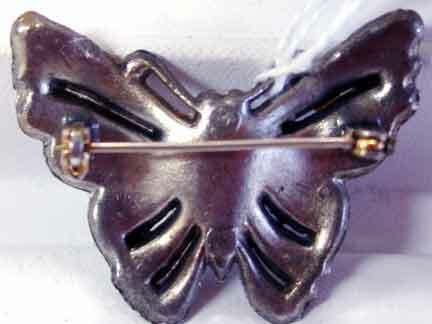 All wired into a pierced metal screen backing covered by a flat metal piece (see photo). 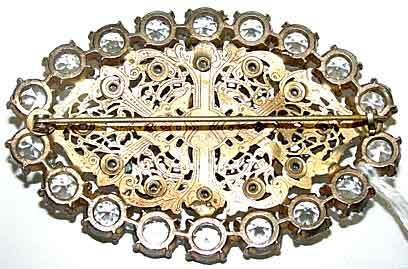 This has all the earmarks of Haskell right down to the ubiquitious minor verdigris on the brass floral pieces. 2 3/4" x 1 1/2". 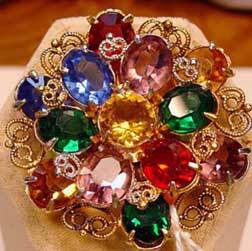 Description: Czech Style Multi Jeweltone Rhinestone Brooch - Typical piece is a nice size for wearing either on its own or as part of a grouping. 2 1/8" x 1 3/8" and slightly domed. I replaced a few missing stones but for the most part all is original here. 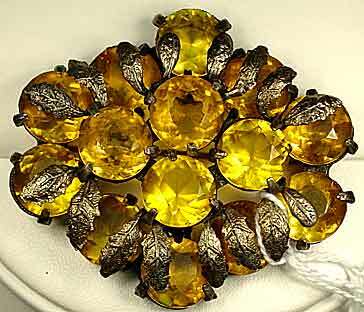 Description: Czech Style Brooch with unfoiled Golden Topaz Glass Dentelles - vibrant golden stones are interspersed with metal leaves; these leaves are worn to the point that they look silver but originally were probably brass colored. 2" x 1 3/4". 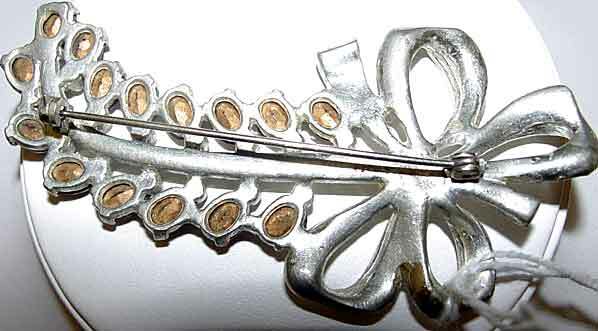 Description: Czechoslovakia Wood and Seed Bead Pin - All the wood beads in this piece are hand sewn into a filigree base and covered by a solid back, marked Czecho Slovakia. 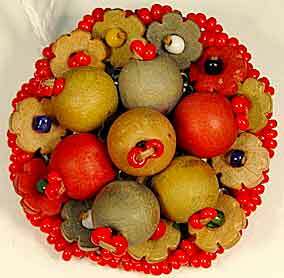 Beads are in a muted mustard, olive green and red orange, with various colored seed beads attaching. About 1 1/2" in diameter. Fun piece for casual clothing. 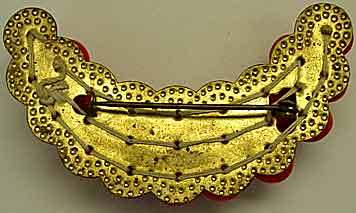 Description: Czech Type Red-Orange Glass Bead Crescent Brooch - Of the type that is often attributed to Miriam Haskell, this 2 1/2" x 1 1/4" piece appears to be excellent original condition, with professional stringing still intact. 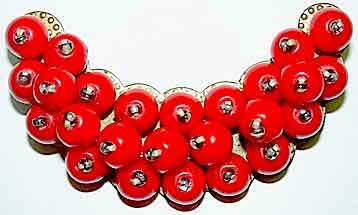 Brass base is decorated with 7mm opaque glass beads in a very deep orange that is almost red. 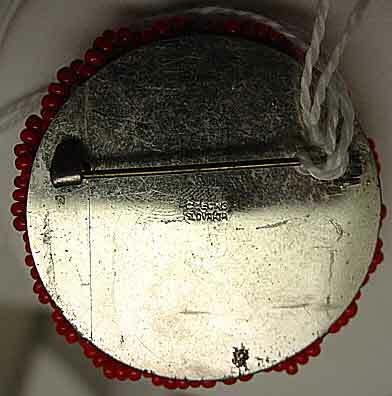 These beads are held in place by what appears to be silver lined seed beads; lining has darkened with time, giving the beads a grey appearance. Slight wear marks on back. 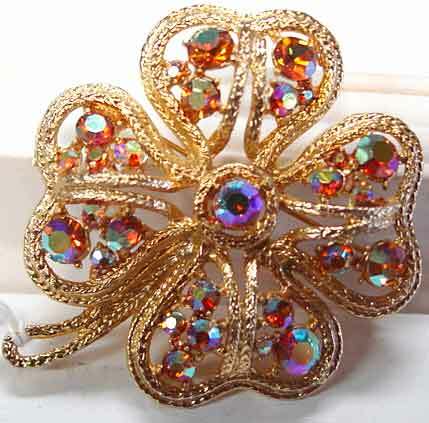 Description: Czech Type Brooch with Multi-Pastel Rhinestones - Very similar to dress clips ND3-060. 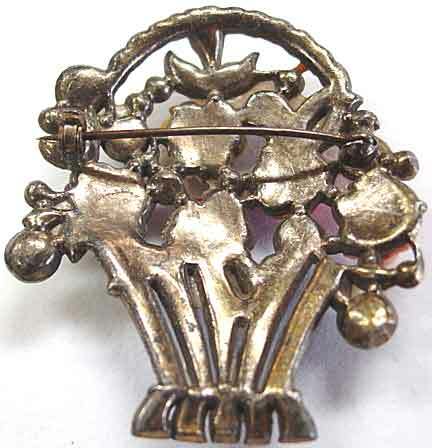 This brooch measures 2 1/4" x 1 3/4". 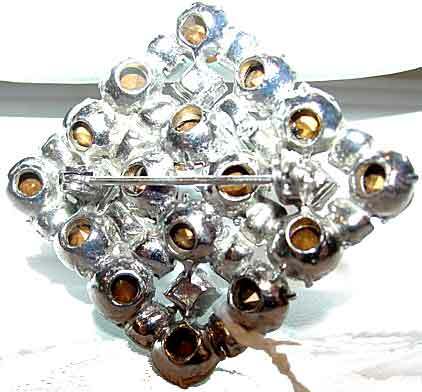 Description: Czech type Brooch with All Clear Unfoiled Stones - Large 3" x 2" piece using 22 large unfoiled dentelle cut stones and 12 smaller unfoiled chaton cut glass stones, all prong set. 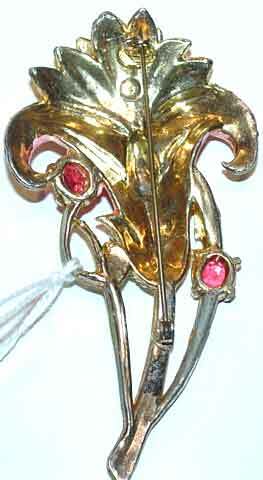 Larger stones are open back, smaller stones are riveted into position on a brass filigree setting. 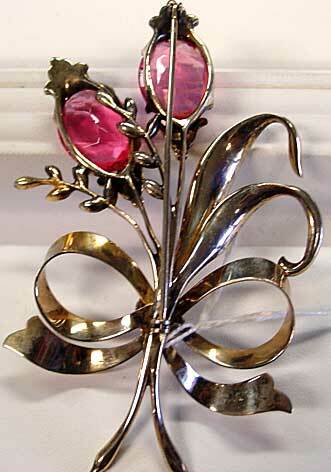 A really nice piece in great condition that sparkles like mad - you will get rave reviews from this piece. 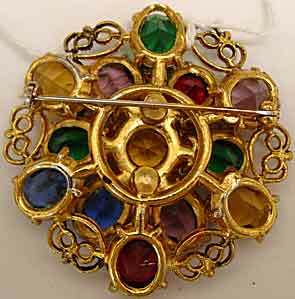 Description: Filigree Floral Brooch with Multi Color Stones - This two layered brooch uses unfoiled glass oval stones in multi jewel tones, prong set in goldtone filigree metal. 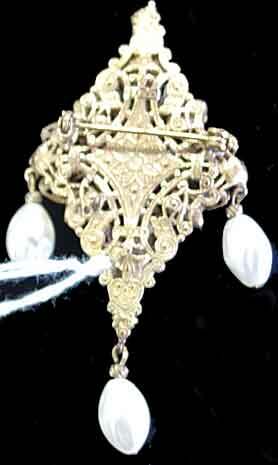 A little of the filigree appears silver, either from wear or perhaps not being gilded initially. Floral motif; about 2" in diameter. 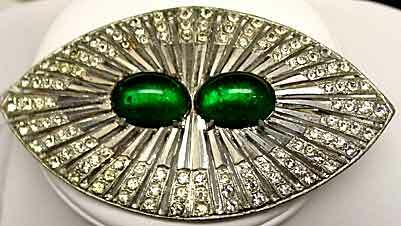 Description: Huge1930's Brooch with Large Green Oval Cabochons - These stones are definitely a dark emerald green in person and in excellent condition. Lots of clear rhinestones go around the edges in rows and were all there except for one that I have replaced. Silvertone potmetal, 3 3/4" x 2" and has quite substantial heft. Great on a blazer, jacket or coat, or even to dress up an evening bag. 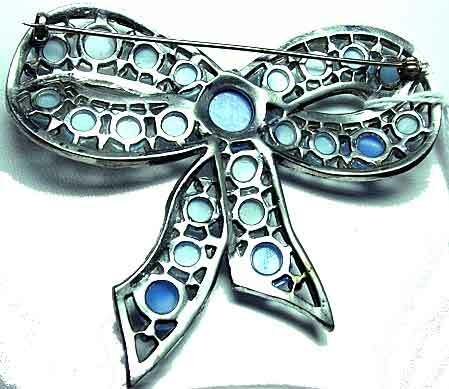 Description: Large Dark Blue Czech Type Unfoiled Glass Brooch - Lovely heavily pronged unfoiled oval glass stones are set in silvertone and accented with small montana (navy) blue rhinestones. Quality pinback, well-made piece. Unusually large for this type of piece - 3 1/8" by not quite 1 1/2". Not old enough to be a sash pin. Beautiful piece in excellent condition.